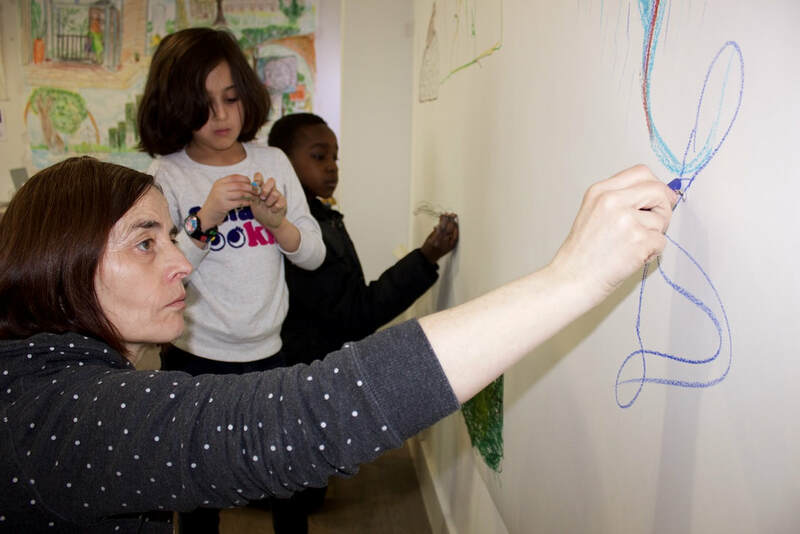 Silchester Residents Association invited back their old friend and former resident artist Constantine Gras to run an art project for the Grenfell affected local residents. 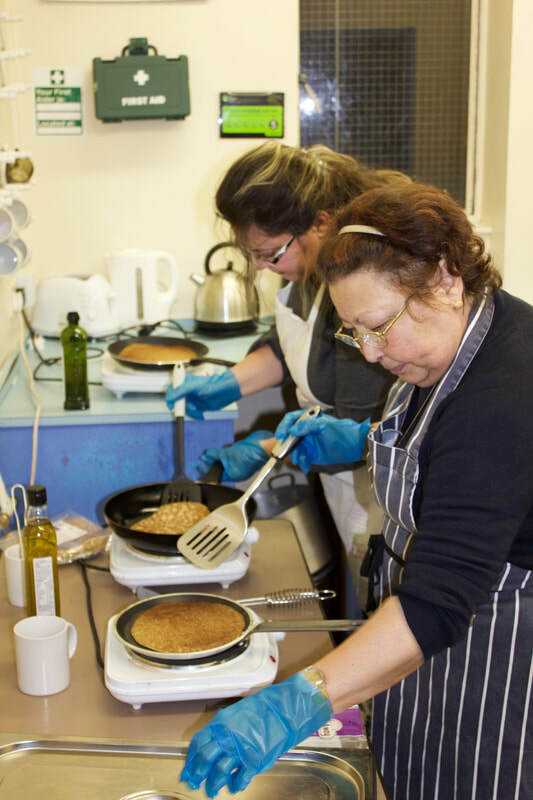 This project was funded by London Funders, to provide therapies and activities for affected residents to mitigate recovery from Trauma. 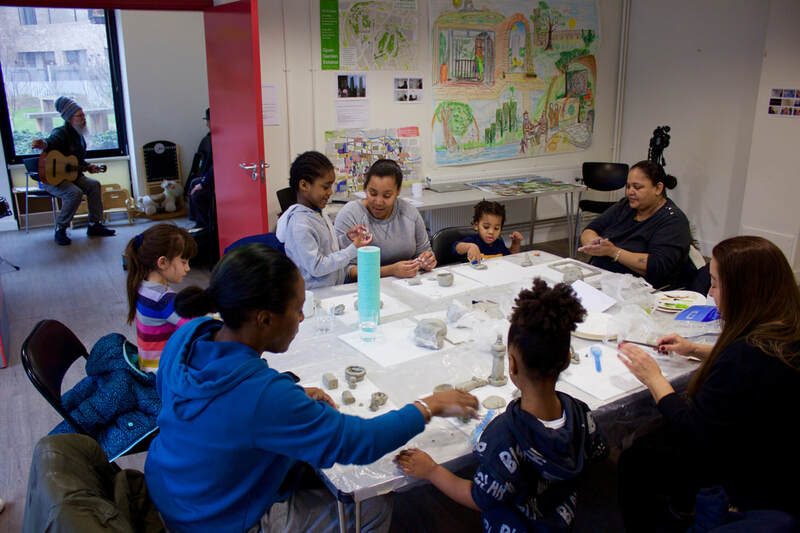 Over 300 local residents participated in the workshops that ran from December 2017 to June 2018. 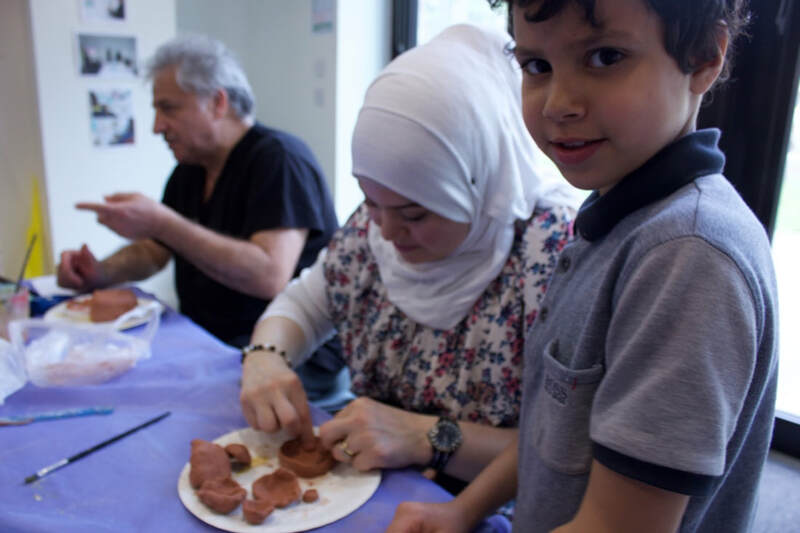 These took place in a variety of locations including in the lift lobbies of the residential towers, in the Silchester Community rooms and during the Iftar street festival on Freston Road, in partnership with the Notting Dale Resident Association based at the SPACE. All of this culminated in a two day exhibition on 30 June and 1 July 2018. A project book will be published shortly. 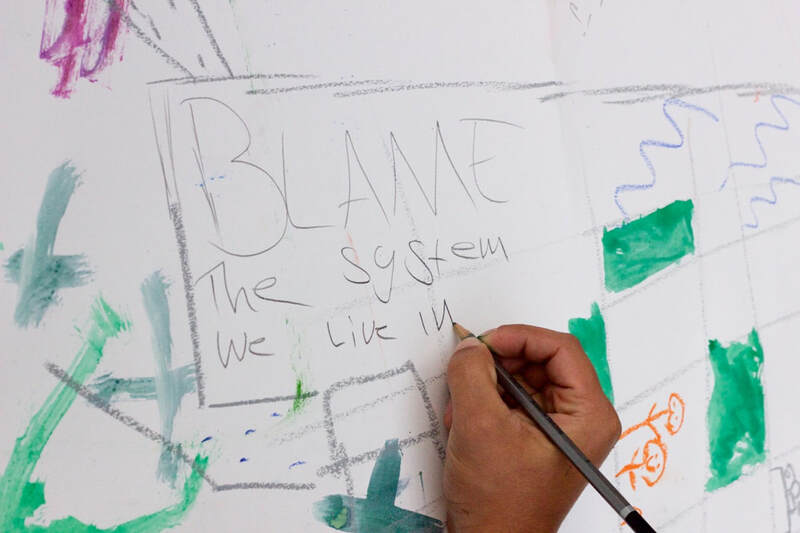 ​Huge thanks to all who participated and shared their creativity, life experiences and humour. 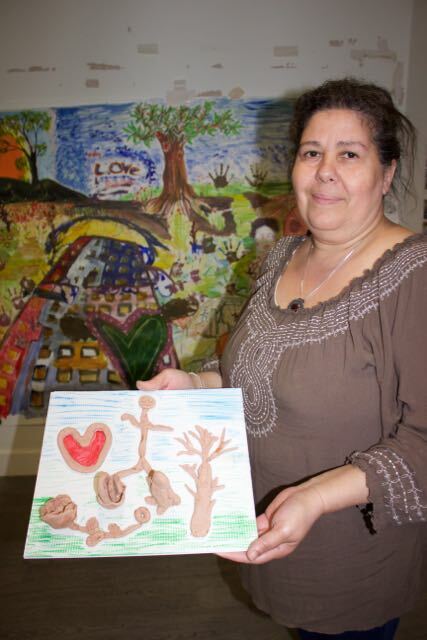 On a blistering hot weekend, we finally displayed all the wonderful art work made by residents over the past 7 months. 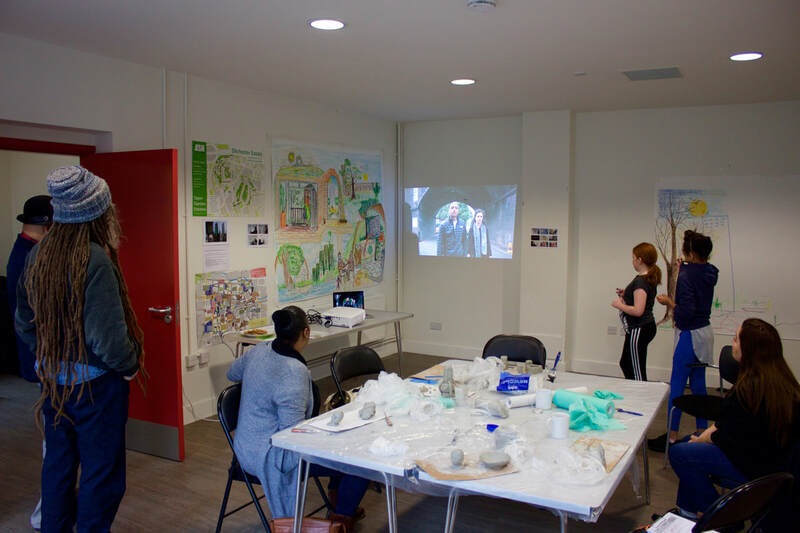 Our main displays were in the residents room at Frinstead House where several large drawings, 45 ceramic art works and a 20 minute film programme was projected. 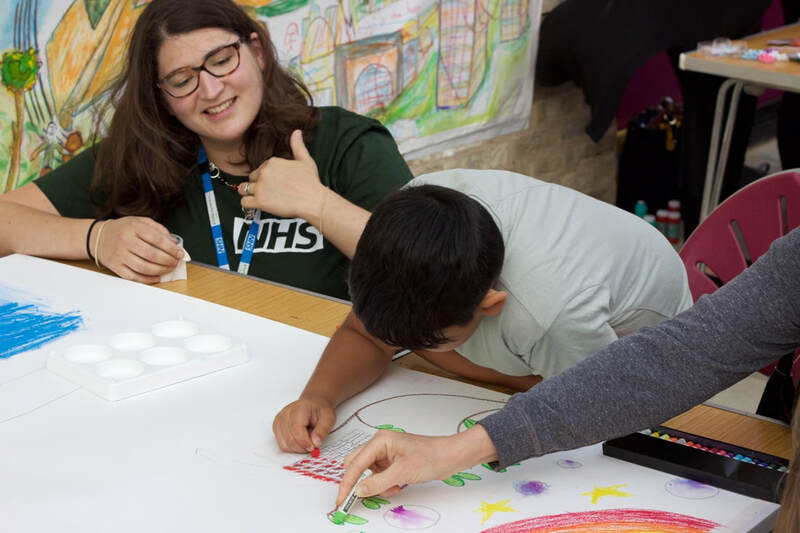 During Saturday, we also ran an art workshop as part of Silchester Fun Day in Waynflete Square; many thanks to Abby Hubbard, art therapist and the Grenfell Outreach Team for their assistance. 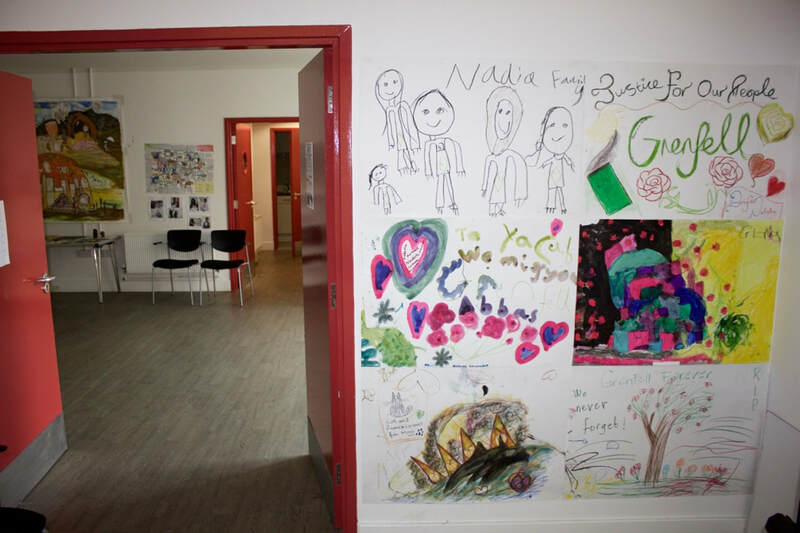 Finally, we were also displaying 3 large drawings in the SPACE at 214 Freston Road. That was a fantastic exhibition. I’ve told lots of people how good it was, but being only open for two days didn’t give enough time for them to come and see it. I was very impressed with the rap film which ended with people and placards saying “we want answers” from the cladding manufacturers, installers, TMO, K&C Council, etc. Your exhibition looked as if all the painters were really committed to doing it. 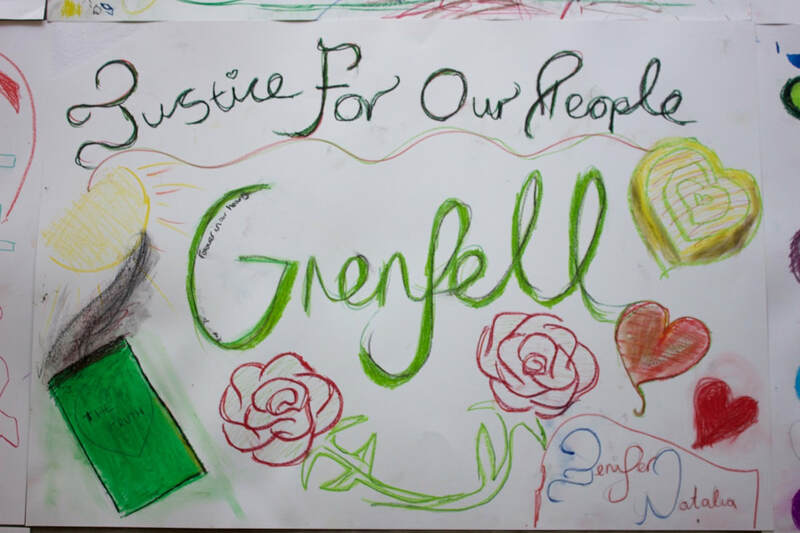 I thought it might be images of people as victims and the burning Grenfell, but the whole message was, we are strong people from this community in bright colours and positive images. Nothing passive in the show. What a brilliant idea to make that huge painting. I hope they are all kept and shown again. Can you get the V&A or the Tate or National Gallery to show them? It felt a bit like paintings done when something awful is happening or has happened but everything looks bright and OK, and you wonder “Where has the war gone”? Then you realise it is all there but not shown in a self-conscious, cliched way. 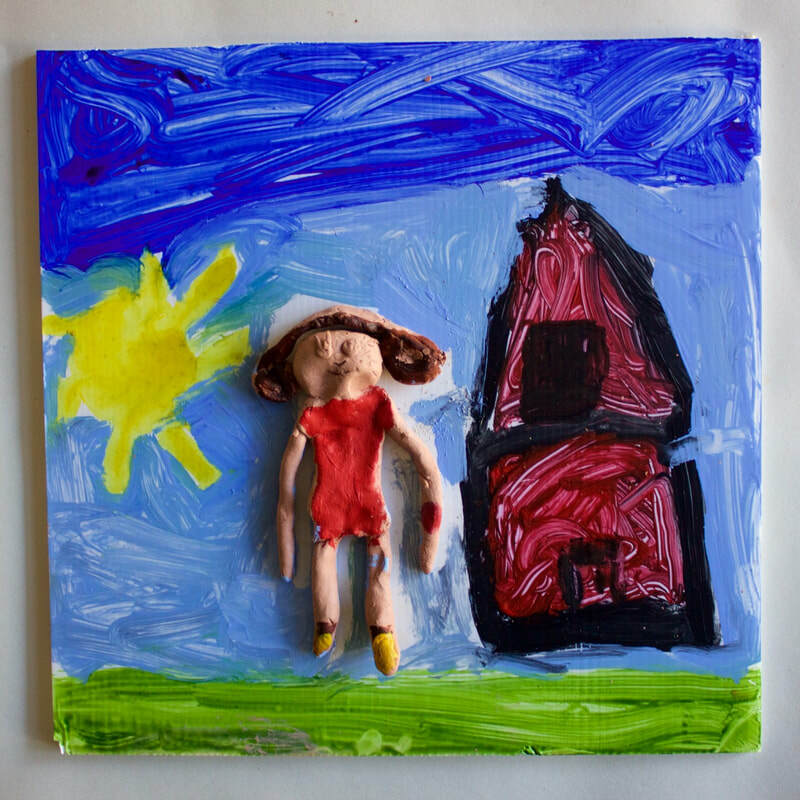 Lovely Art work at the Art for Silchester exhibition: music making, clay and sculpture work, drawings, paintings and film work made by over 100 children and adults. Amazing talent on view. It looked like a perfect summer’s day. The sky was blue, the sun was shining and the air was warm. But something devastating was happening. Something no one could believe would or could ever happen! On the north side of the building, the birds were singing and the trees looked as if they were embracing the morning sunlight. But on the east side, there was a tower on fire as the sun rose. We have really enjoyed attending the sessions. 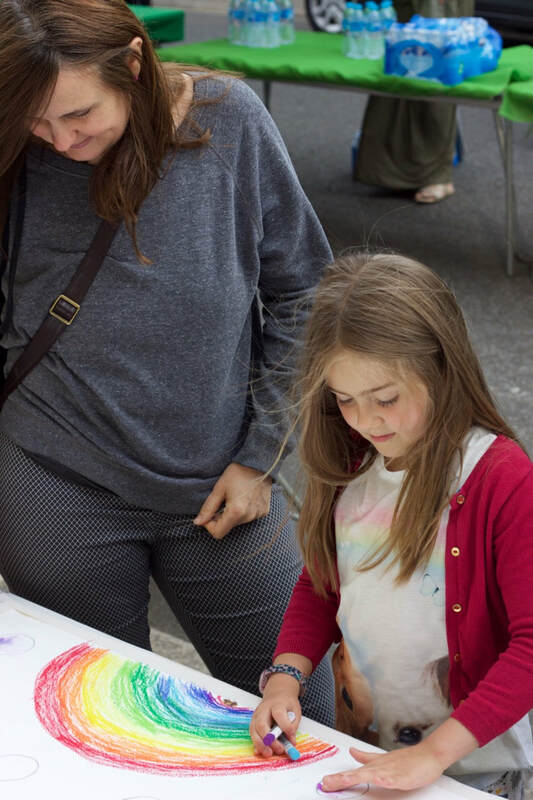 Not only has it opened up our creative side, that I didn’t realise I had, but it also brought us together; so many people from the local area, that I would not have met otherwise. 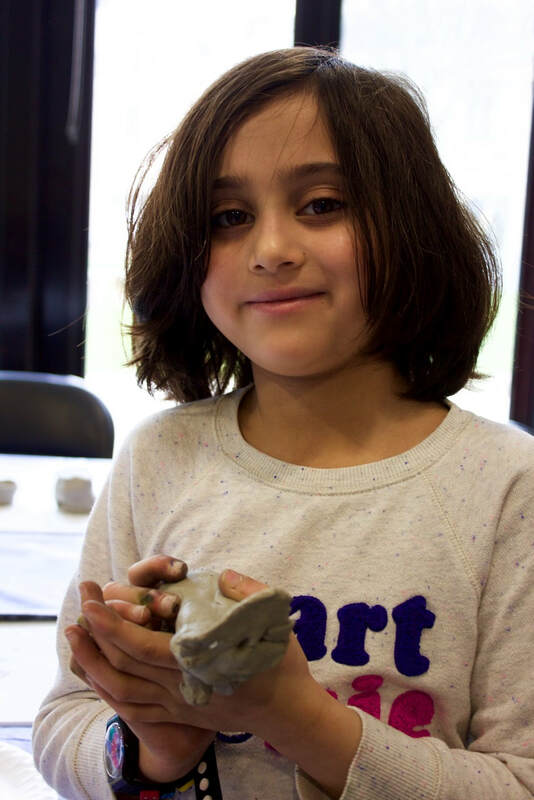 We are really sad that it has now come to an end, but we are proud of the work we and the other residents have made...and hope to continue working with clay in the future. 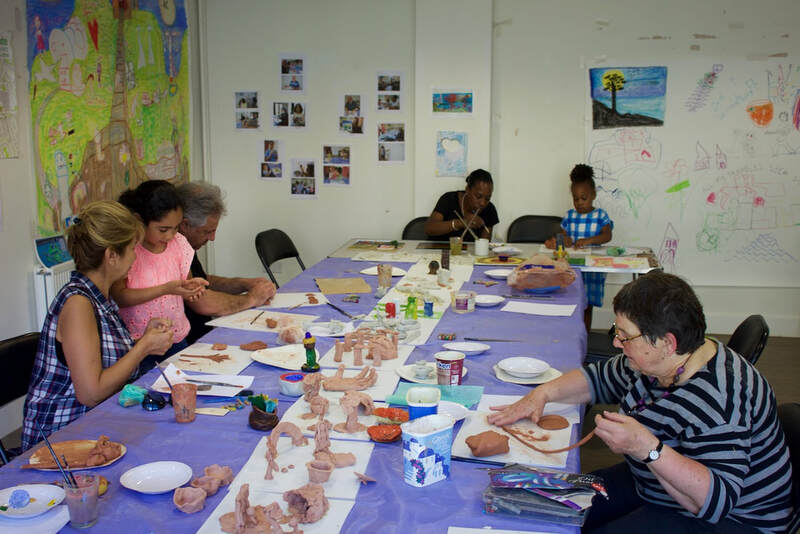 Out of the tragedy of Grenfell, we as residents have been united through clay. And our work represents it. 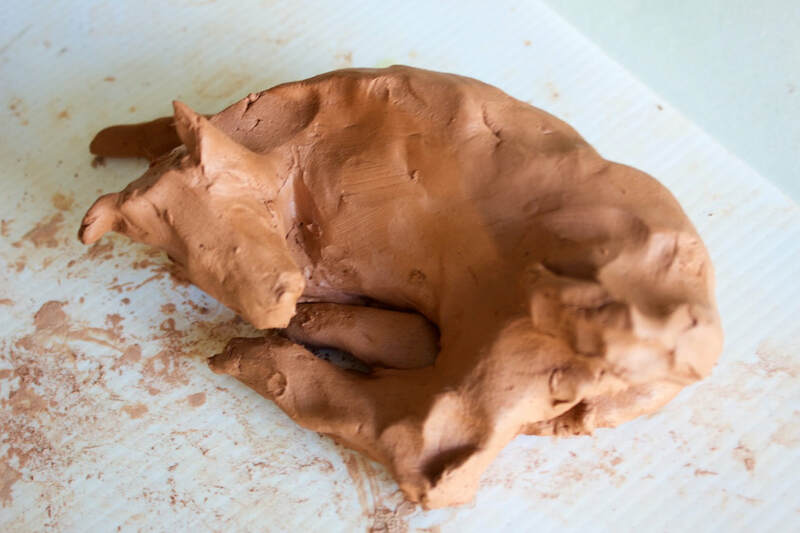 My sculpture made of clay is of a couple kissing. It is based on a painting I made that was inspired by a Picasso portrait. My art piece is based on protecting. It is a building with a banana peel. When it is peeled, it is protected. 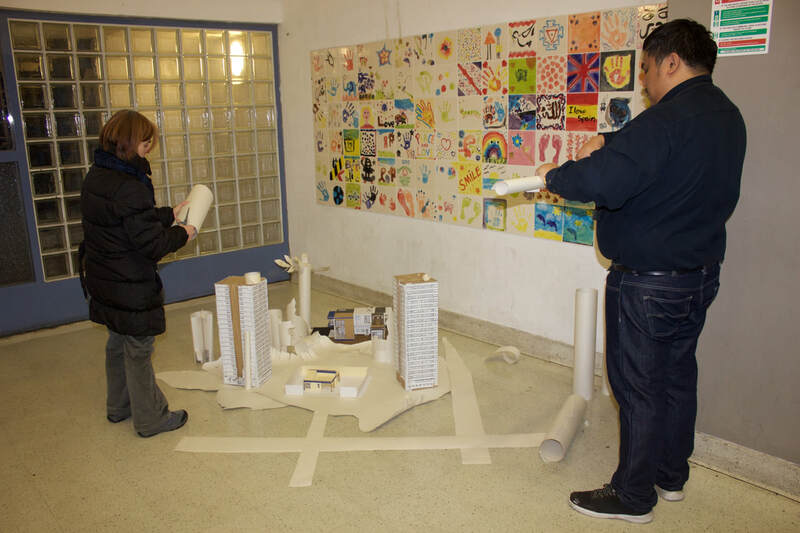 My art work is a model of our community. It is a happy place even though it has had its ups and downs. I’ve lived here for my whole life. I am an optimist. I love many things: happy thoughts; rainbows and marshmallow clouds; unicorns with purple manes and pretty pink flowers. I am also aware of sad things, but they don't hold my interest much. 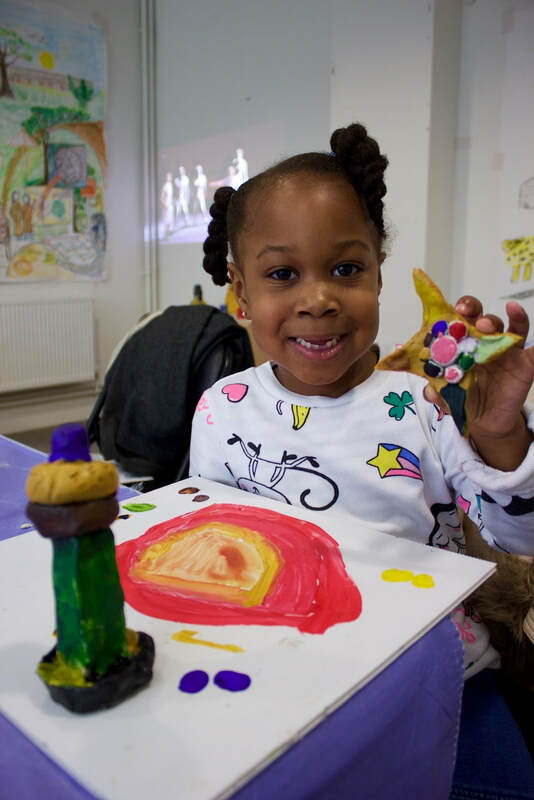 I made a flower, a rainbow, a replica of my doll, a bed and a fancy pinch pot. I used bright colours to make it pop off the board. It has been really fun making everything, so every Sunday I say, "Is it the workshop today?" Her tears will never stop. She keeps praying and still asks why? Her baby girl and grandson, engulfed, trapped. They never made it out. The red building swallowed them. I made a fruit basket in clay and then I painted it. It was all about colourful fruits, to try and show their beauty. I made a lion and it was fun. It had pointy claws. Today was an awesome day. 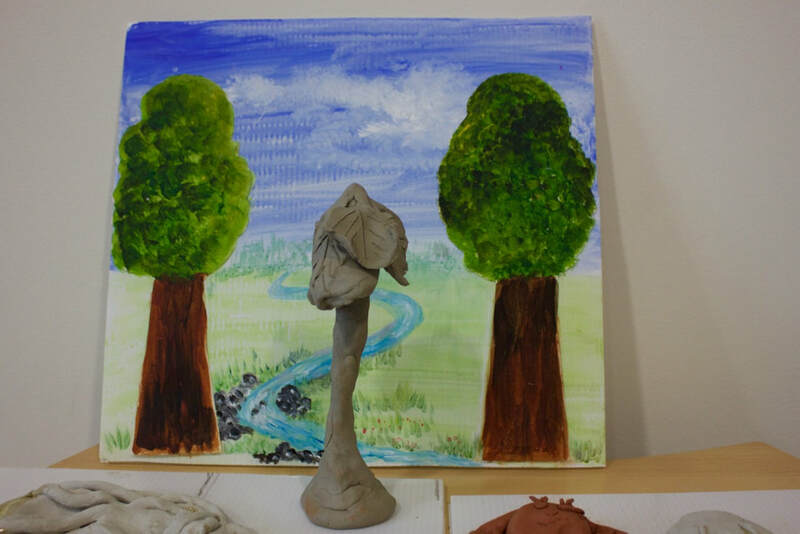 I really enjoyed using the clay and moulding it into different objects. It felt cold and squishy in my hands. I like painting my work and making it come to life. In my drawing, a man has been badly injured and slightly burnt. He has got cuts and bruises. He has lost an eye. ​He is sad about it. But he knows on the inside that he will recover. I made a lovely work from my imagination. It is based on the Somalian flag. ​Our ocean's give life to our Mother Earth which is why we should protect and keep them clean for the future of our children and their children. The clay dolphins are the first time I have ever used clay. Absolutely wonderful exhibition and so much real talent on display. 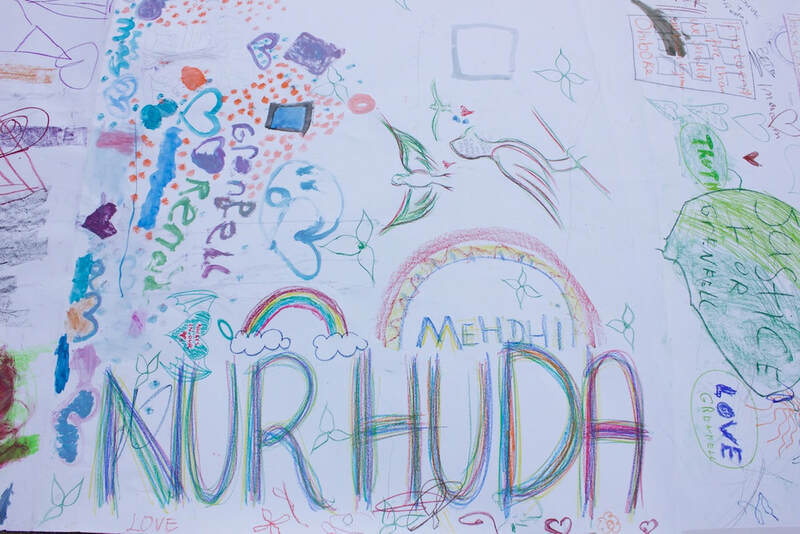 Dear Silchester Community, you saw horrible things but what came out of your response is the force of life. The art that gives all a direction from the depth of your hearts. 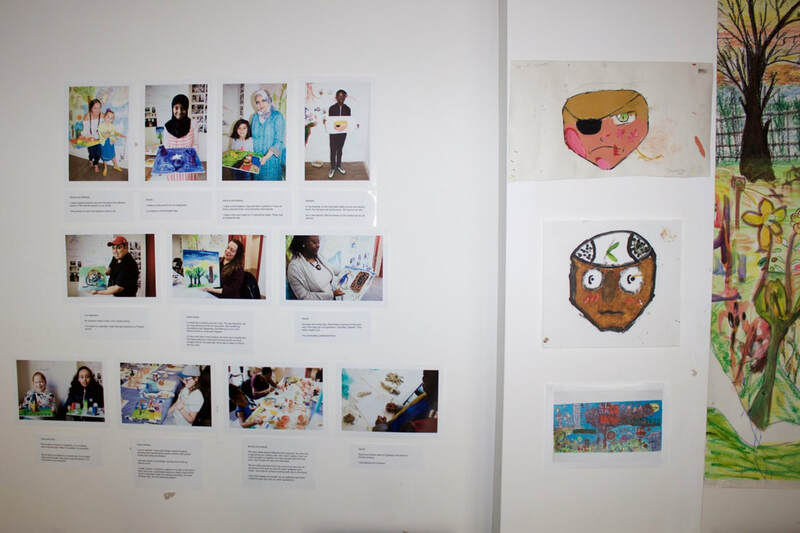 Really enjoyed the exhibition - all the work displayed together looked amazing. The video really represented the community in a positive way with everyone coming together. It was a great experience for me and my daughter. 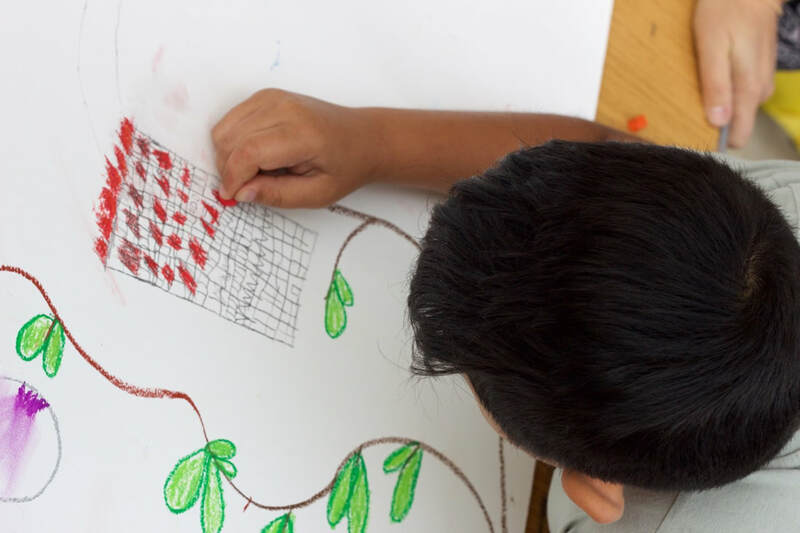 Nadi: These art sessions are inspiring and relaxing! 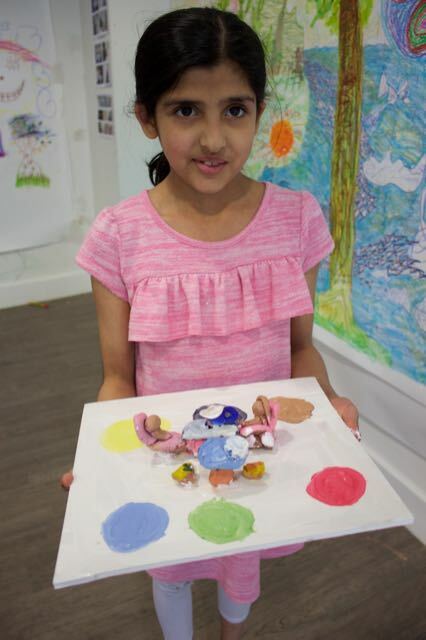 Ayesha: I made a lion and it was fun. It had pointy claws. Today was an awesome day. Asthma: It was an amazing session. In the previous one I made a fruit basket and today I painted it. It was all about colourful fruits. To try and show their beauty and how they are such a delicate creation. Thank you for the opportunity! 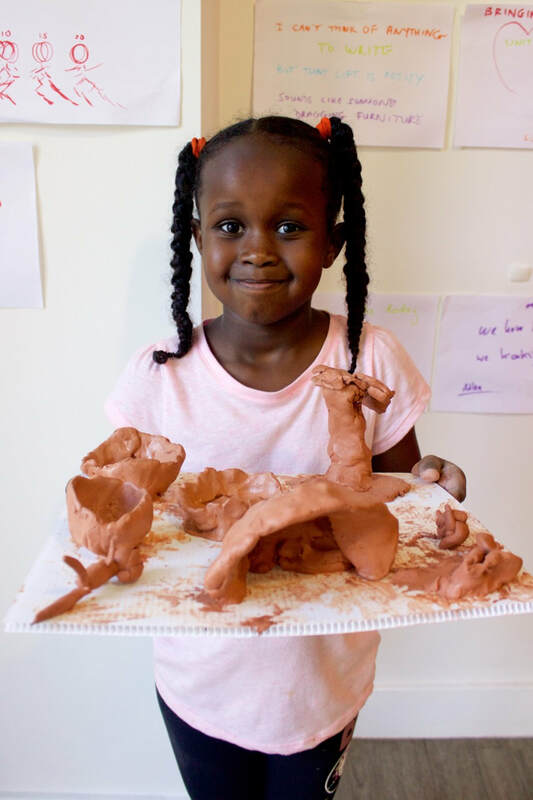 Mathilda: I really enjoyed using the clay and moulding it into different objects. It felt cold and squishy in my hands. 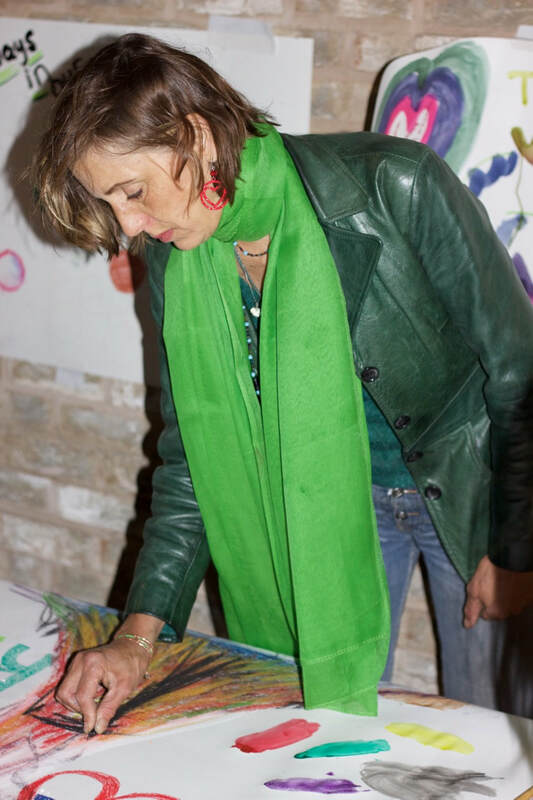 Most of all, I liked coming back and painting my work, making it come to life using many different colours. 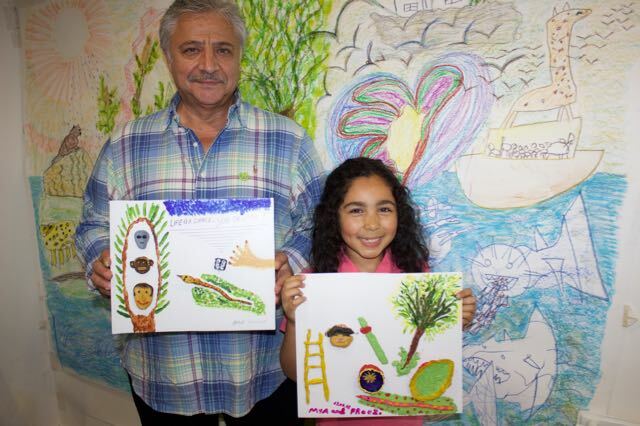 Daniella: In my drawing, a man has been badly injured and slightly burnt. He has got cuts and bruises. He also lost an eye. He is sad about it all. But he knows on the inside that he will recover. 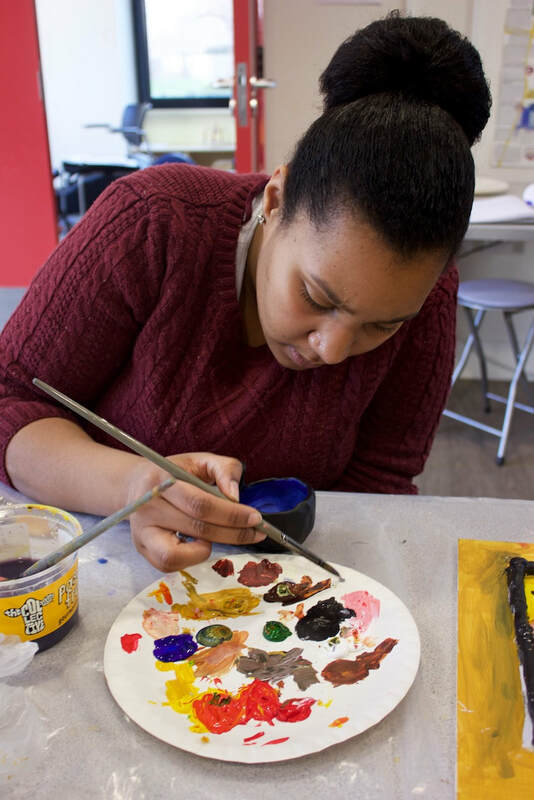 Eleanor: Thank you, I've had a lovely time rediscovering clay and trying acrylic paint! The picture of Grenfell is what I see (or rather saw) from my window in Waynflete Square - although I don't actually live here, I only visit. Keep up the good work. What a brilliant community there is here! 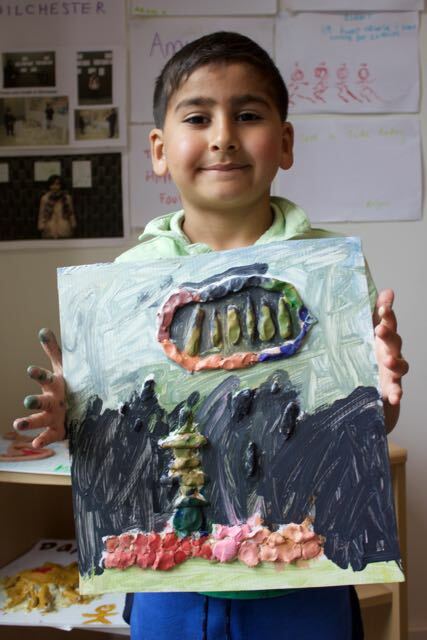 Aishah: I made a lovely art work from my imagination. It is the Somalian flag. 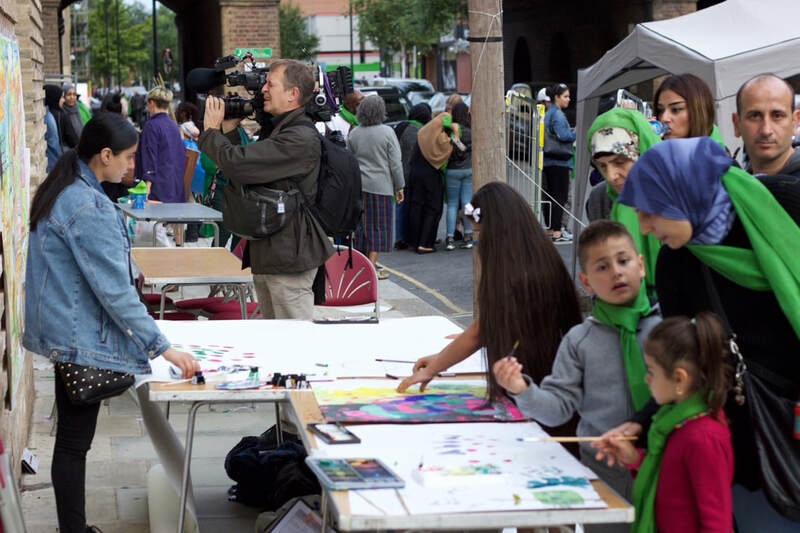 We took our art workshop out of the studio and onto Freston Road as part of the Iftar celebration that marks the end of the Ramadan fast. 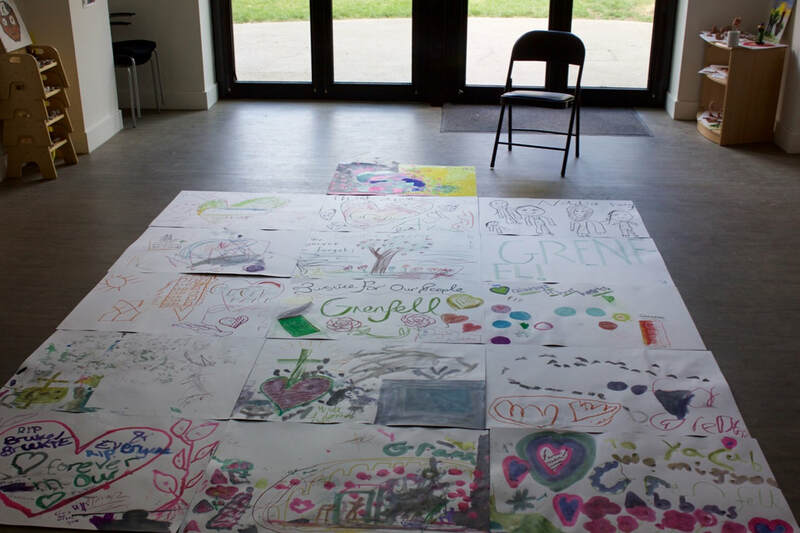 Many thanks to the estimated 50 participants in our session and we now have two amazing large scale works of art, one measuring 1.5 x 9.5 meters. 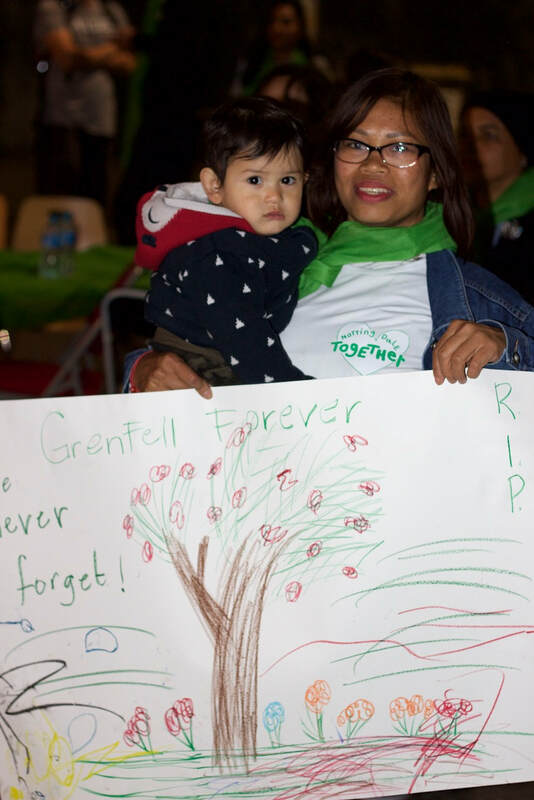 Poignant tributes were recorded in memory of those who were lost to us in the fire. 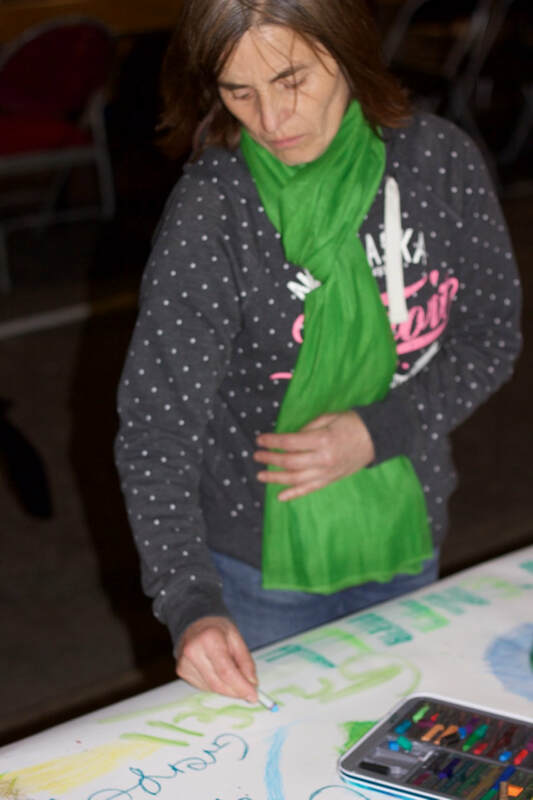 Abby Hubbard and the NHS Grenfell art therapy team offered brilliant assistance during the evening. 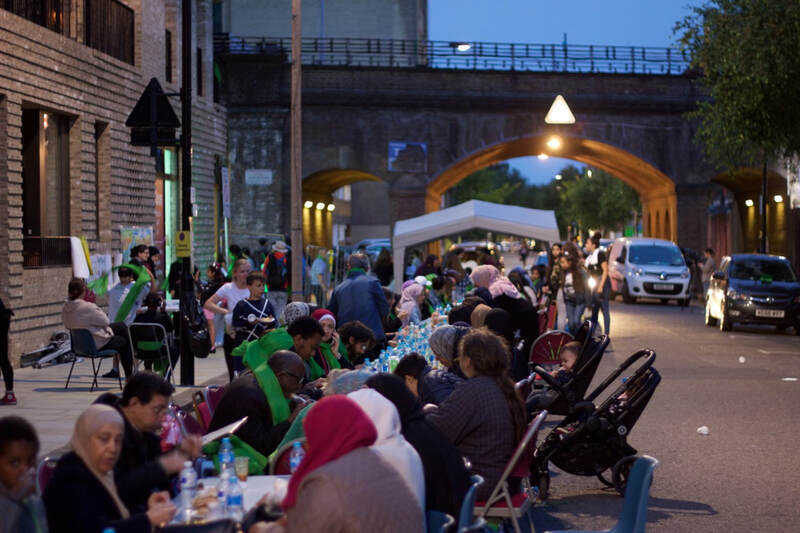 Final respects to Angels 4 Grenfell who are based at the Space, 214 Freston Road who organised all the brill activities and the scrumptious feast. We had a super session with 20 residents. 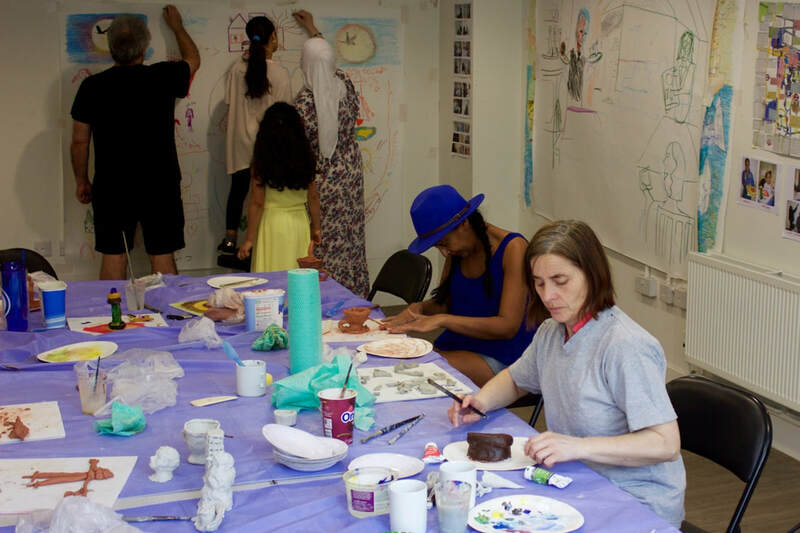 Most of them were returning to paint their air-dried ceramics and it was lovely to see such diversity of art. and a philosophical board game about human evolution with snake, dice and the motto: "Life is a gamble you decide!" 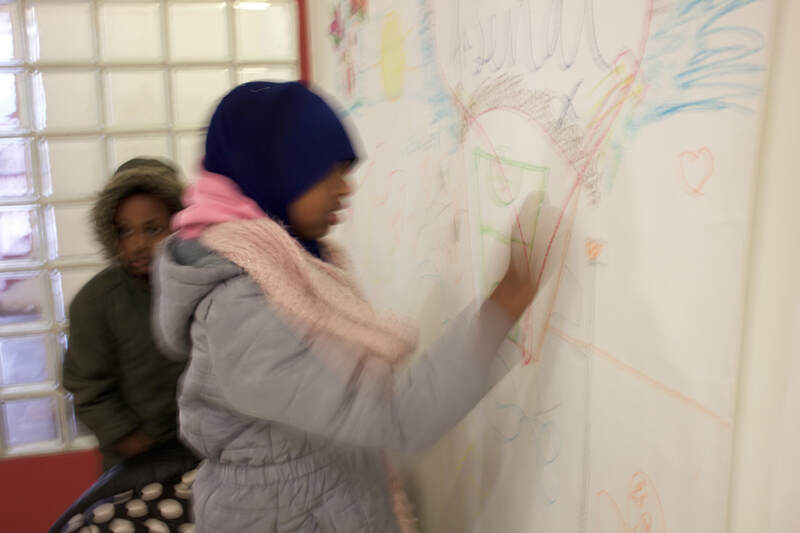 Eman: "It was very engaging. 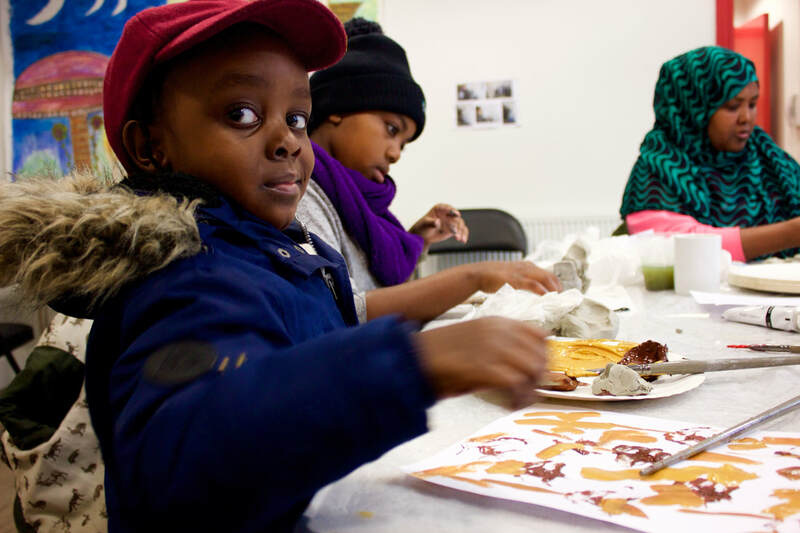 Children were very happy making their art work and I enjoyed the session." 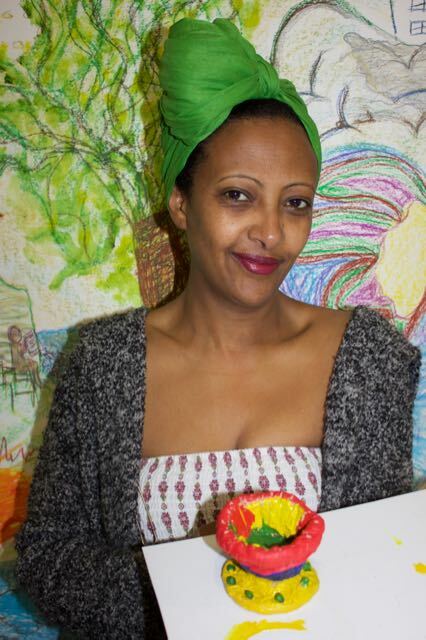 Lina: "Today I came to finish painting my pottery. It was nice talking to different people and having a relaxing afternoon." Nahid adding in a sleepy cat of Silchester. 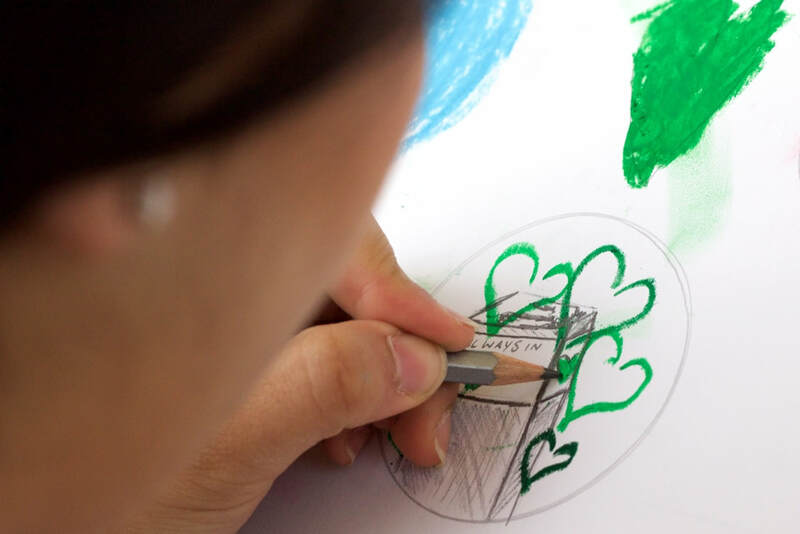 Jamie creating a sequel to her lovely art work from the last session. Children's art work, cloud and rain, flower baskets and tree with detailed foliage - the latter supervised by Mathilda. 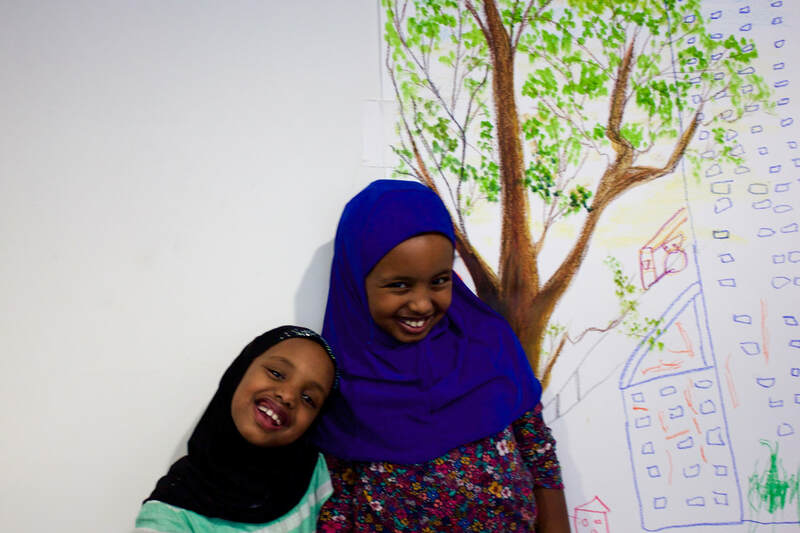 Forouz, Eman and Adara creating vivid landscapes teeming with flowers and happiness. 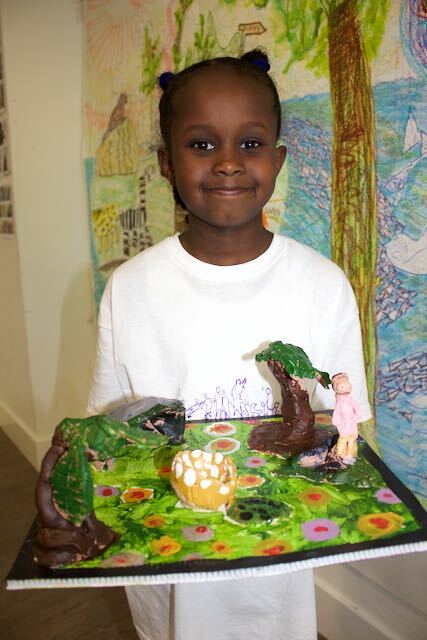 Liba with her tea and cake party scene. 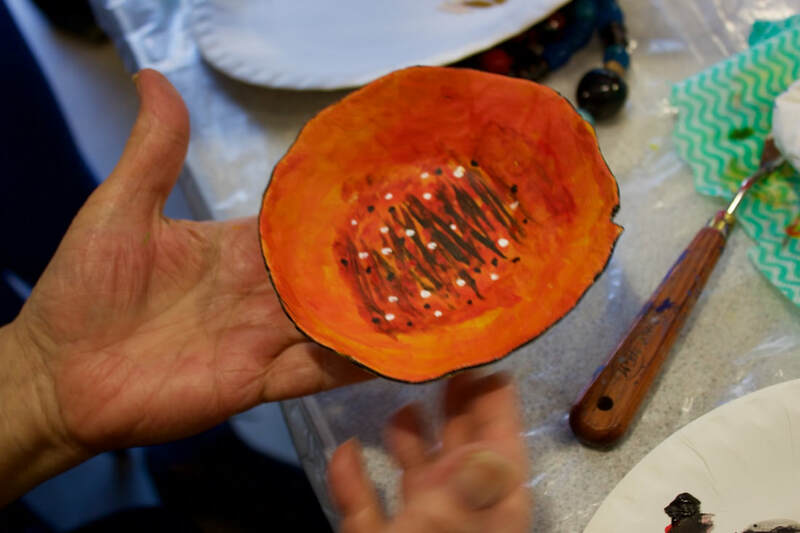 Kerdesan making a bowl with detailed floral sculpting. 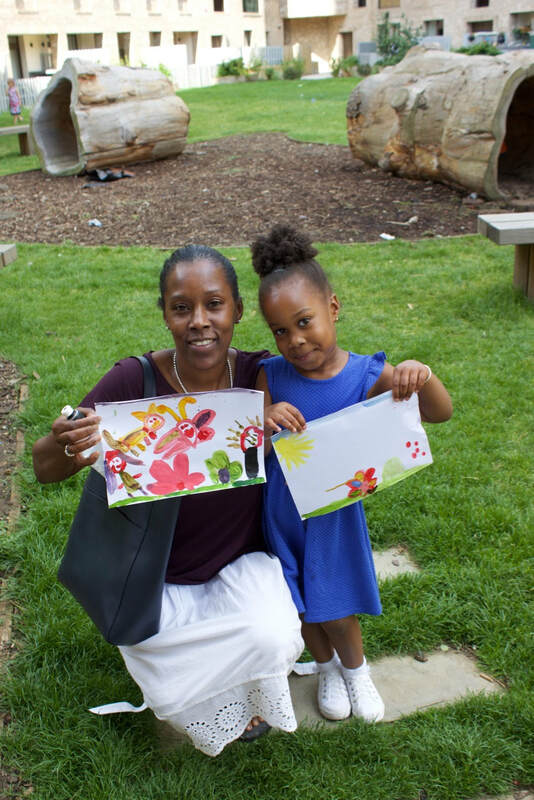 Monica and Aaliyah in the garden of More West. Mohammed Tehrani creating a witty and philosophical riddle about the evolution of human life. This session was a time to review all our work over the last 11 sessions and plan ahead for our forthcoming exhibition and project book. We also told residents that some of their art work would be reproduced as part of the perimeter hoarding display around Grenfell tower. 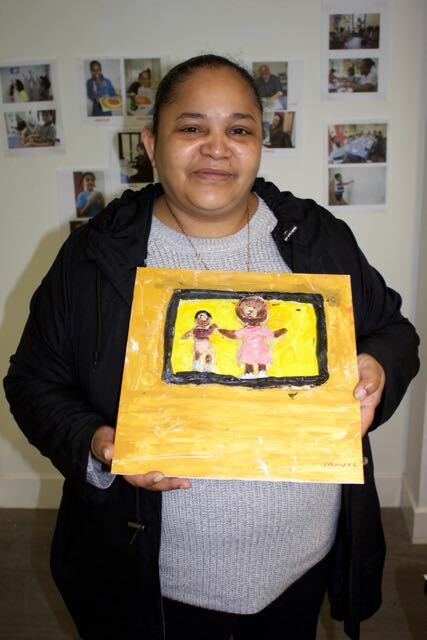 The amazing mother and daughter partnership of Monica and Aaliyah produced a new mixed media ceramic and painting. A pulse of pink light from the house attracts the fish and turtle to the waters edge. Mirror image of Danny and Mohammed. 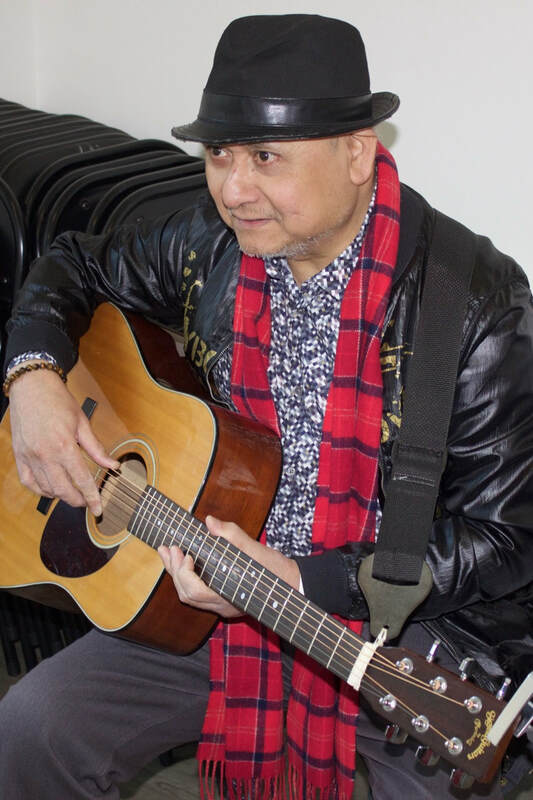 It's wonderful to welcome back, our in-house musician, Danny, who is recovering from a serious illness. 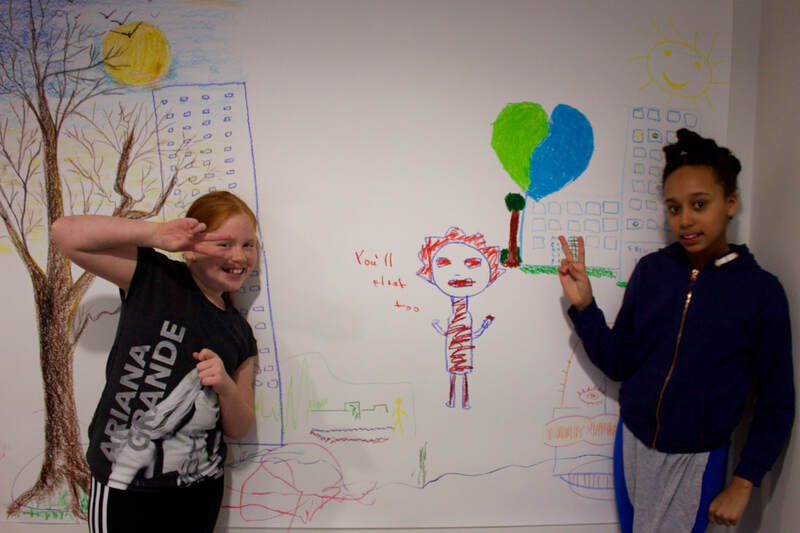 He added the words to our drawing from the Beatles classic song, Yesterday. Thank you Mohammad for bringing a lot of fun to our session! 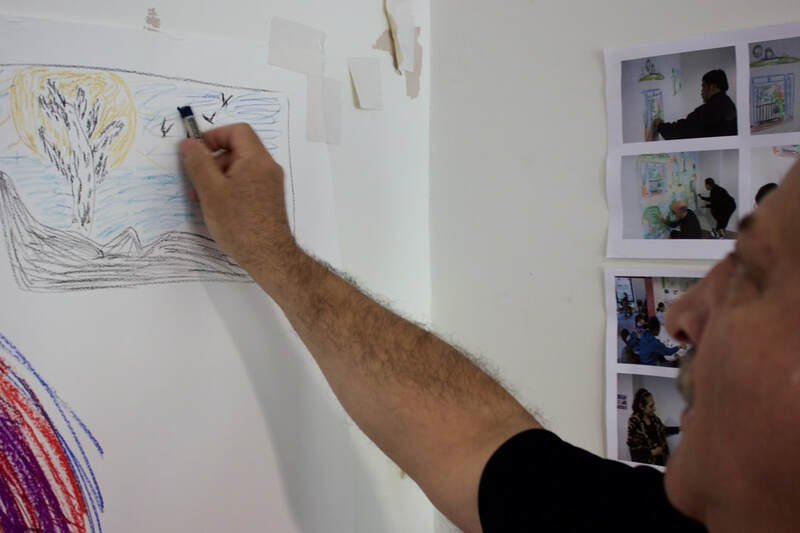 He is captured drawing a landscape with birds in flight. 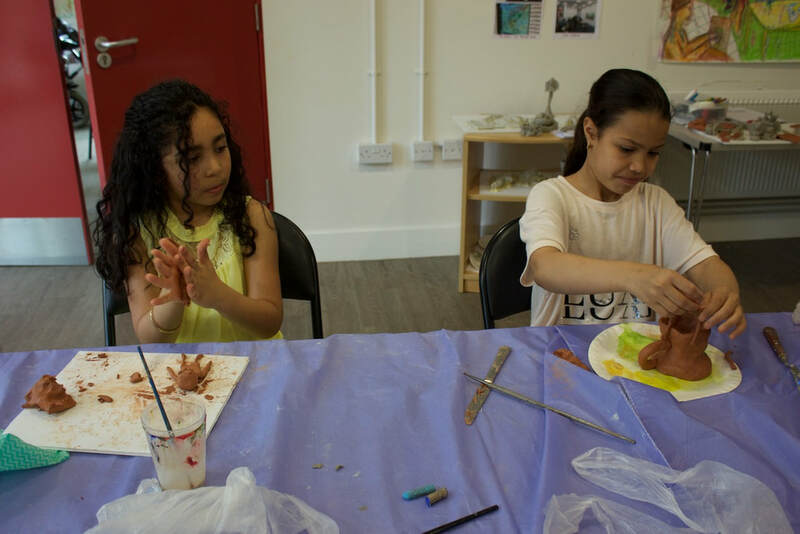 Mya producing an exquisite art work of a girl outside a house and Forouz working with clay for the very first time making a lovely leaf. Eleanor wasn't sure what she was making. A horse? A calf? Whatever it is, it's lovely! 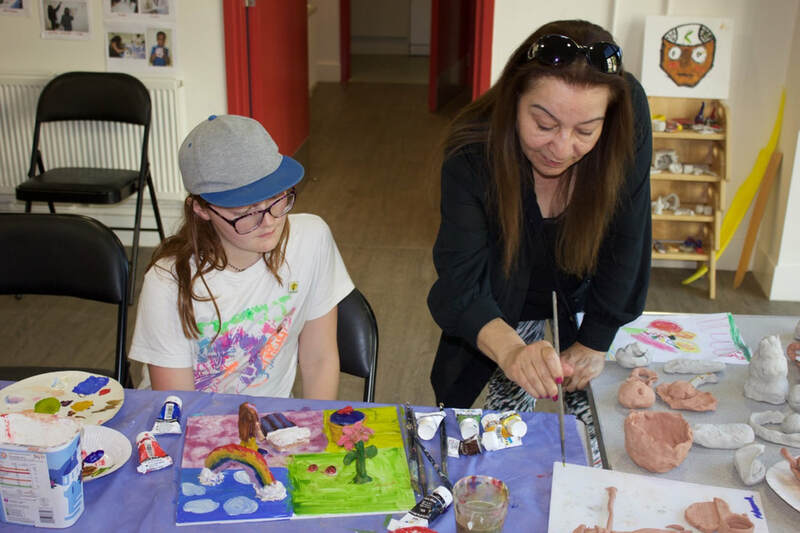 Nahid advising Jemie on how to mix colours. We ended the session watching on in awe as Jemie produced this masterpiece! Besnic has never worked with clay and came up with this striking robot. 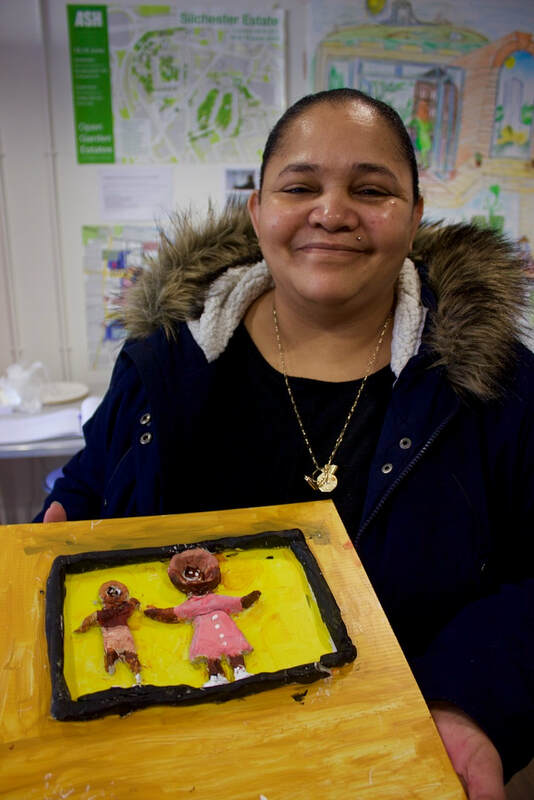 Dora painting her clay model of Grenfell tower with a tearful person. Really nice session. Easy way to meet new people and have fun. 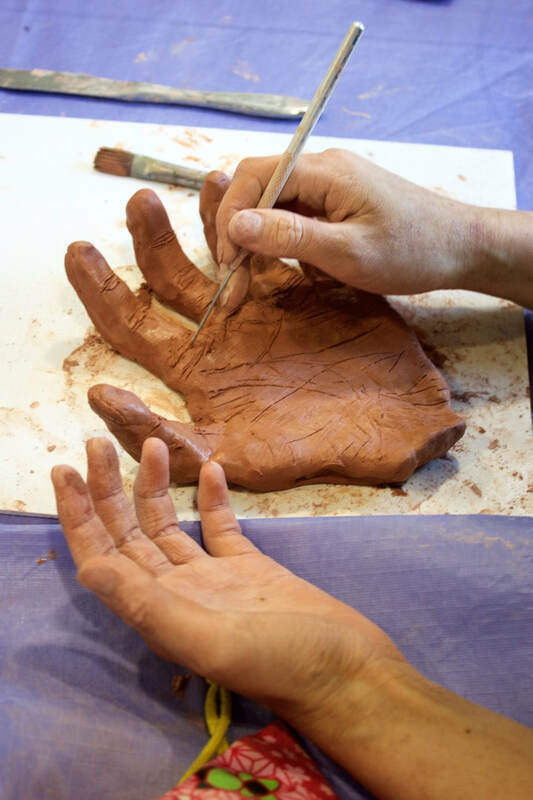 1st time I've played with clay for about 25 years! 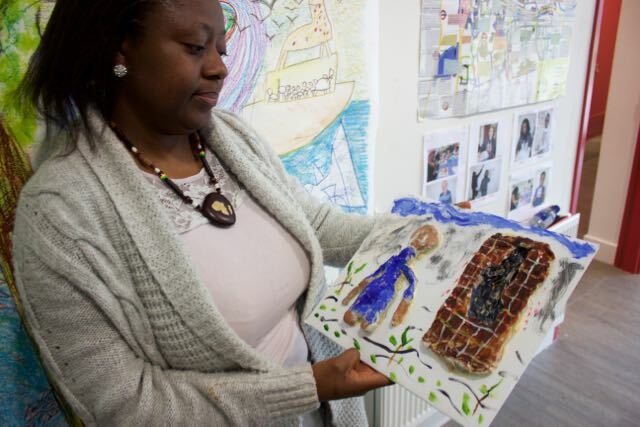 Isaiah with his model of the artist in residence at Silchester Estate. 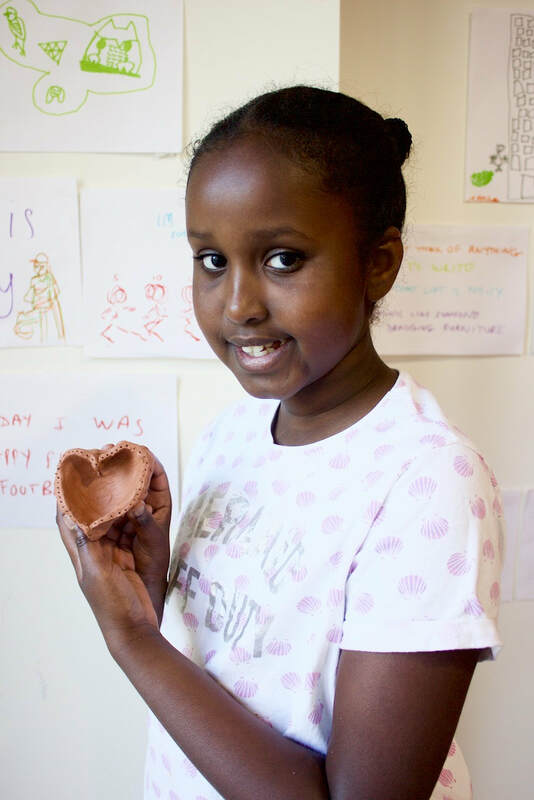 Tolman created this perfect heart-shaped bowl and Gabon made a cave, tree and assorted pots. I am so glad I came to the art workshop today. What a beautiful relaxing thing this is! I like this place because you get to be creative. I would like to come to this place again. I love it because it has clay and a playground, crayons and a big board that you can colour on. 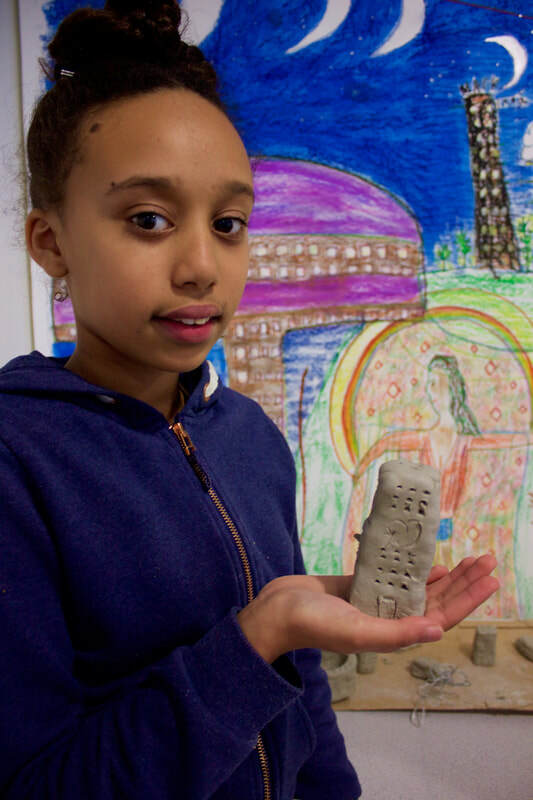 Nadifo and her clay representation of Stonehenge and prehistoric people huddling in a cave. Jemie made a clay doll, bed, rainbow and lady beatles. Thank you for the relaxing time. It was really fun! I and my daughter enjoyed it. "Hand" can create positive things. I just imagined positive, powerful, but still gentle kind feelings." 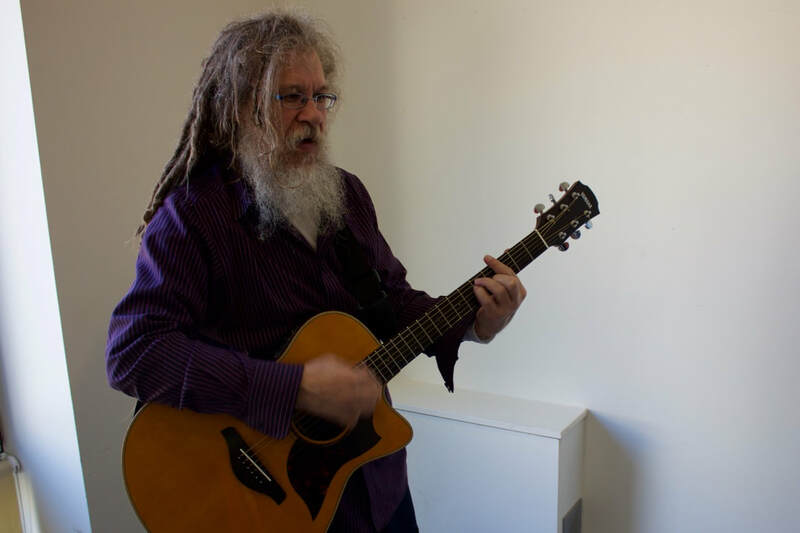 We are sorry to hear that our good friend and regular session musician, Danny Klaisumrid, is suffering from ill-health. "Today, I had an amazing time. 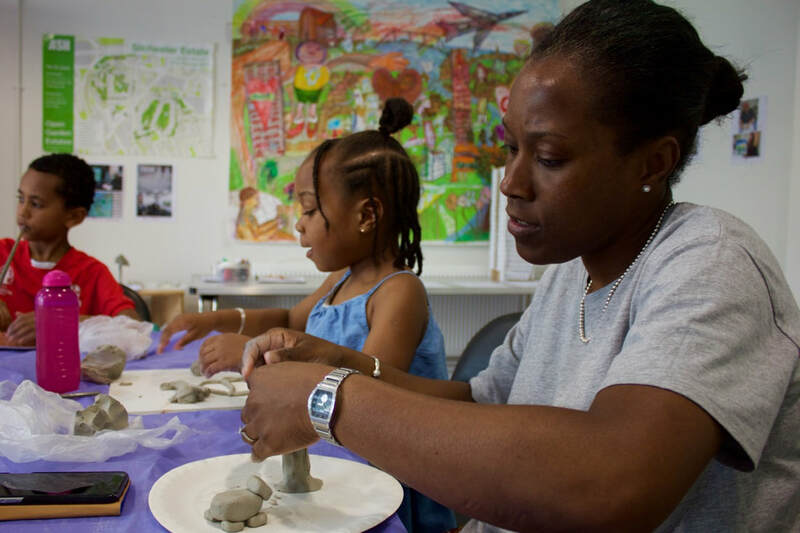 It was very relaxing and therapeutic for me and my children. Thanks for the great time you give to our community." "I made a pot with some soup and peas. And a spoon! I had an exhilarating time here." 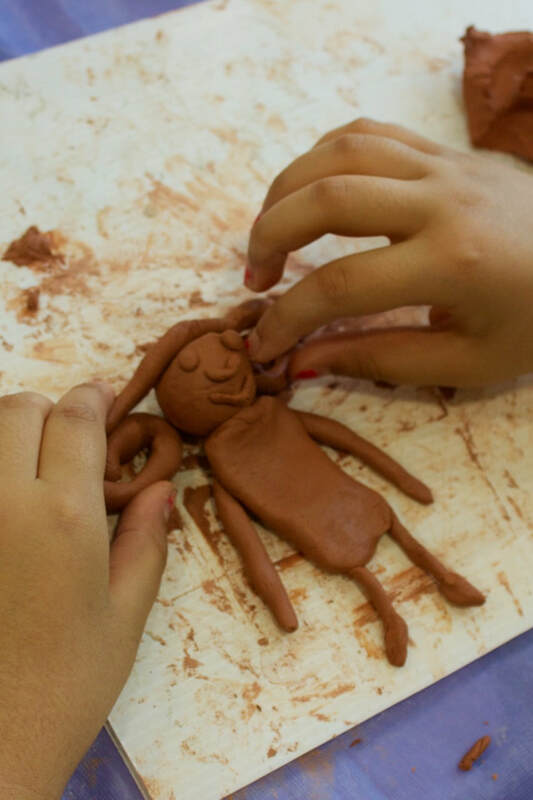 "I made a person out of clay. It was so fun. Everybody should come. Thank you for listening. From Mya!" 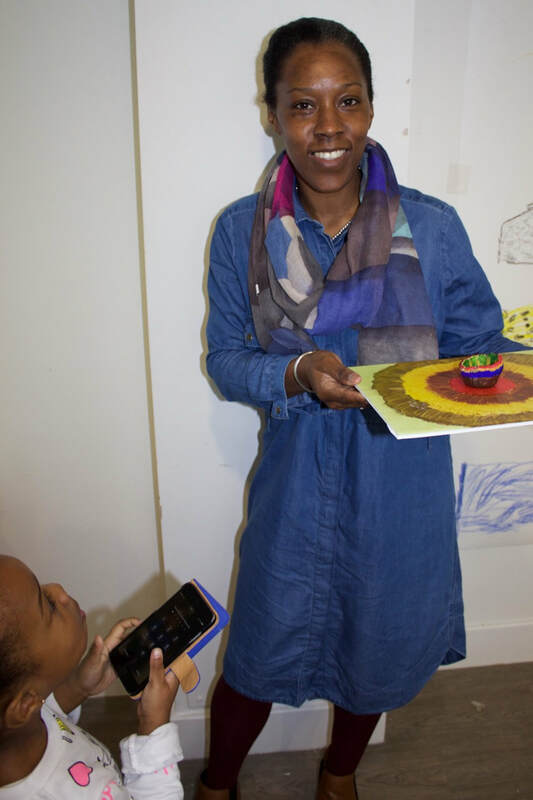 "Today, I made an incense burner, tribally used in Ethiopia and Eritrea. Thank you!" 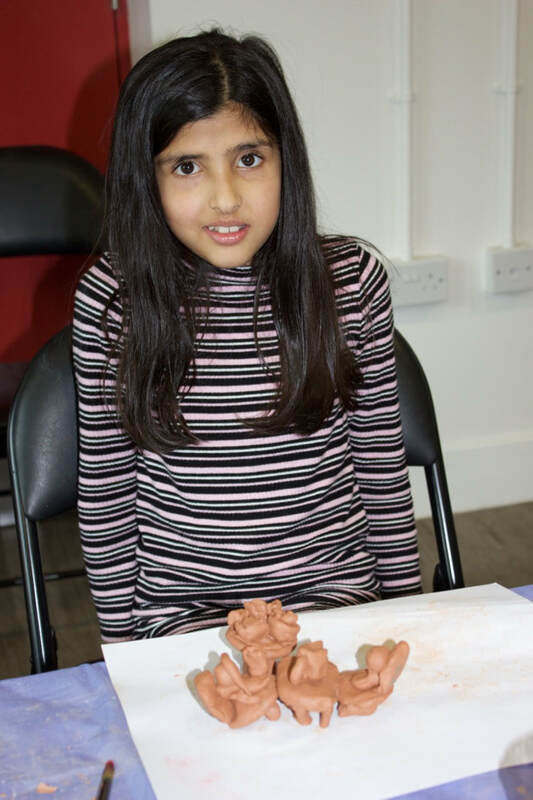 "I enjoyed playing with clay and making models with my friend Ahmed. I also enjoyed the music at the end." 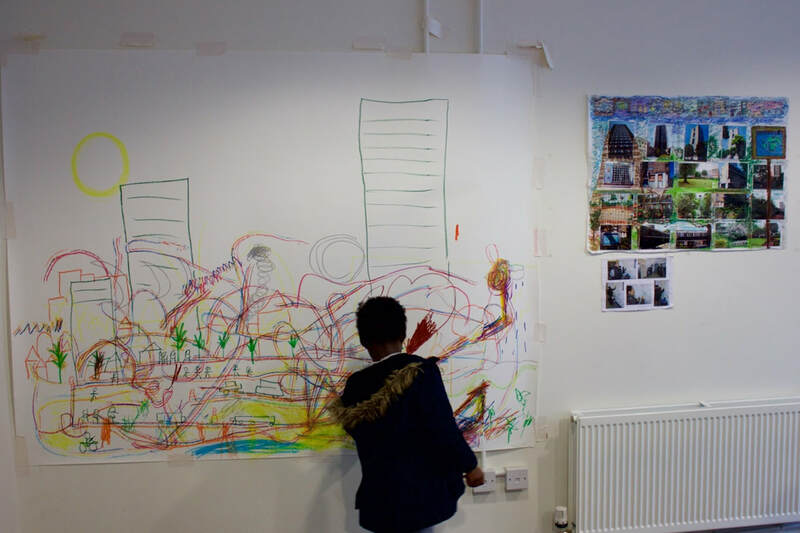 ​This session we were treated to a masterclass by some of the most talented artists on Silchester Estate. 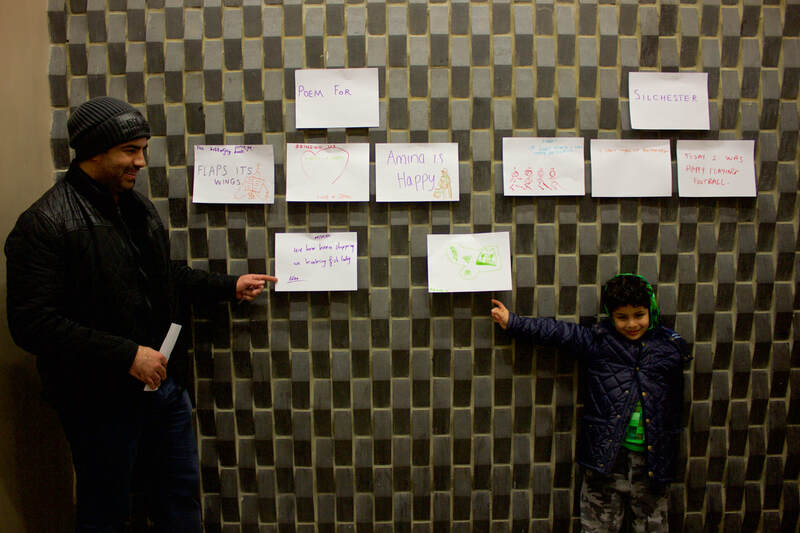 Nahid, Danny and Lex shared experiences and emotions ranging from sadness to joy. What it felt like on the day their lives changed forever? 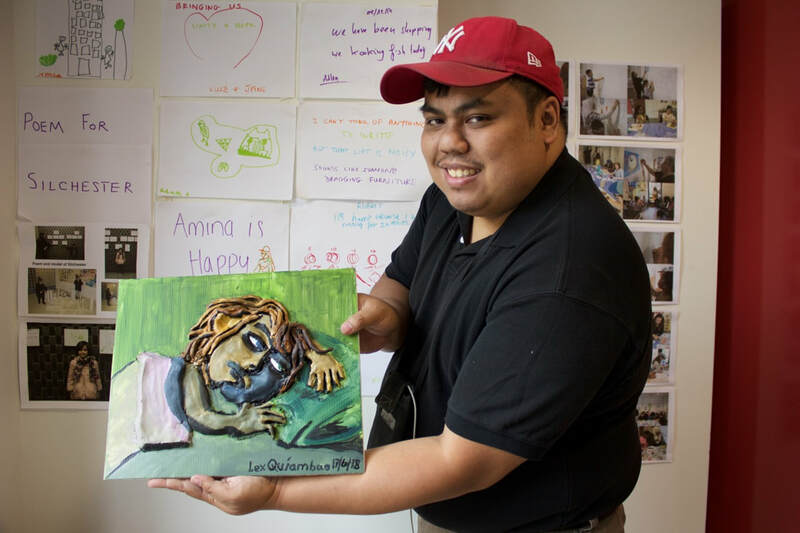 Lex Quiambao: "My sculpture made of clay is of a couple kissing. 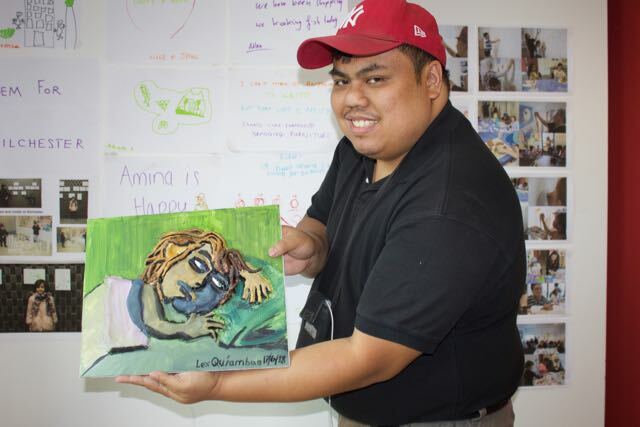 It is based on a painting I made that was inspired by a Picasso portrait." ​Danny Klaisumrid: "It's nice to be here once again after my break to Thailand. It feels good to be part of many great sessions. I love to sing and play the guitar and drums. To create an atmosphere of things that will come together with the arts and music. 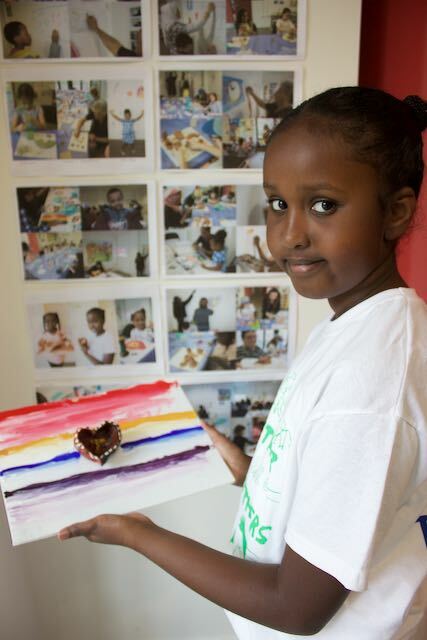 I hope to see more young artists in our community. What is your gift? Please come and share it with us." 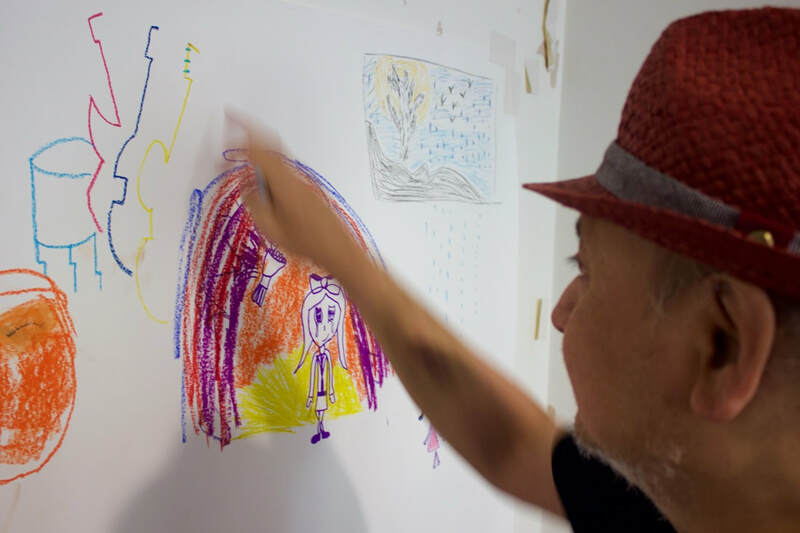 The lyrical soundtrack in the film was produced by three musicians, Tsharna Daniel, Ben Golightly and Danny Klaisumrid who each work in diverse genres: soul, classical and rock music. This was a one-off, improvisatory and inspired session recorded at the Latymer Community Church. We thank Tsharna, in particular, for her gifted work as singer and songwriter. 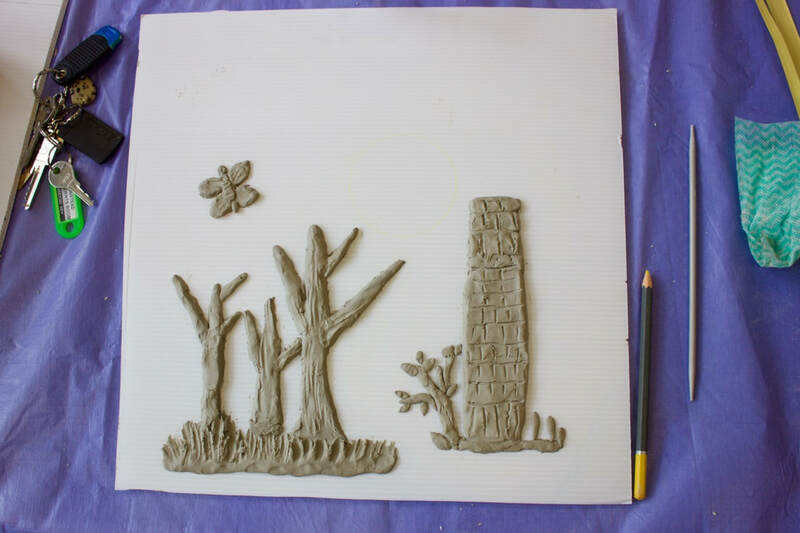 Clay landscape that is about to be painted. 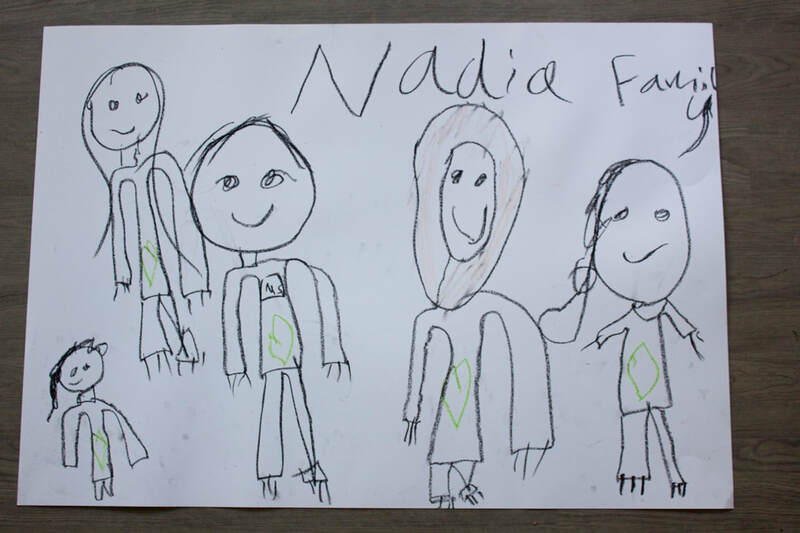 Fab art work by Nahid Ashby. 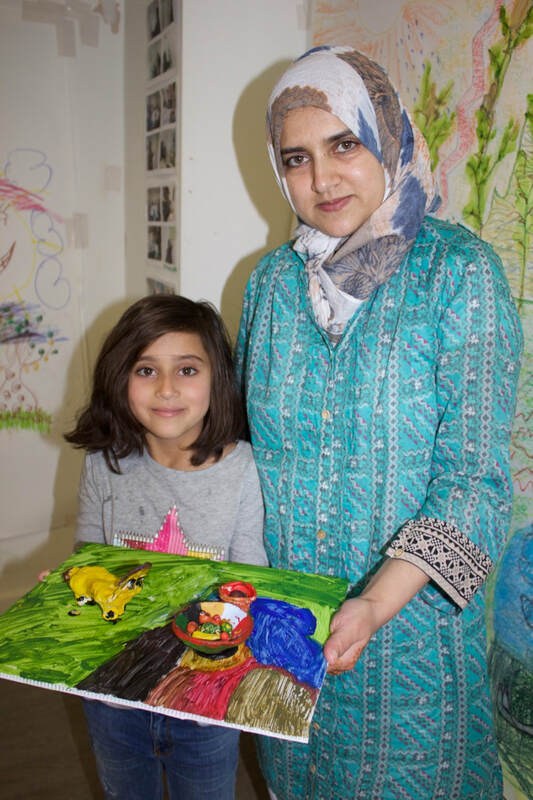 Asma and daughter Ayesha working on an exquisite fruit bowl and a hungry lion. 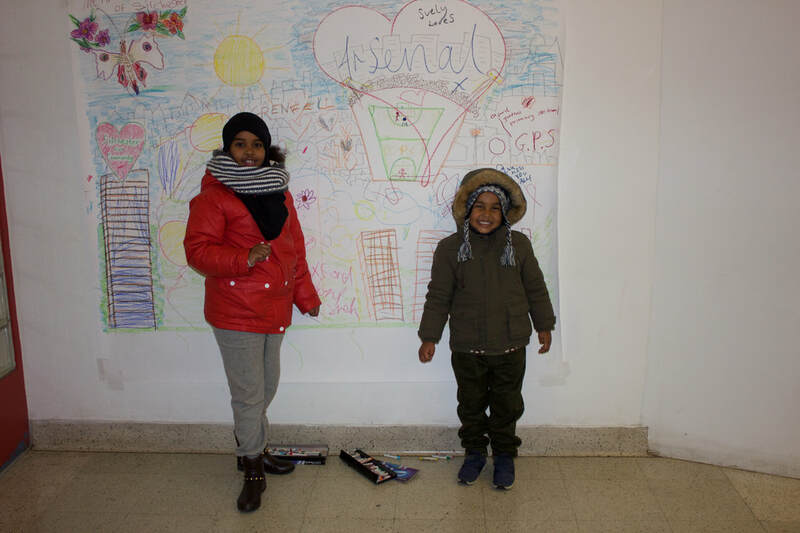 Asthma: "Art work and drawing session was really amazing. It's a good way to spend time. Looking forward to the next session." 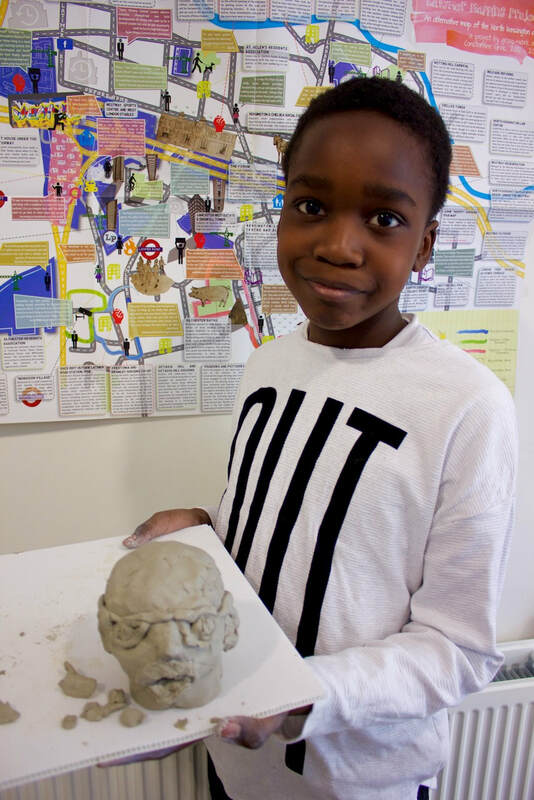 Isaiah having fun and making a sculptural representation of artist in residence, Constantine Gras. 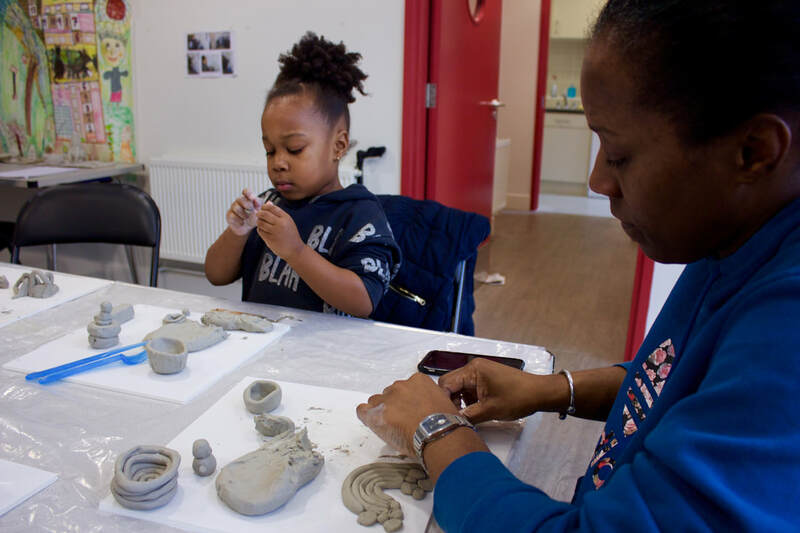 His mum Dora has never used clay before. 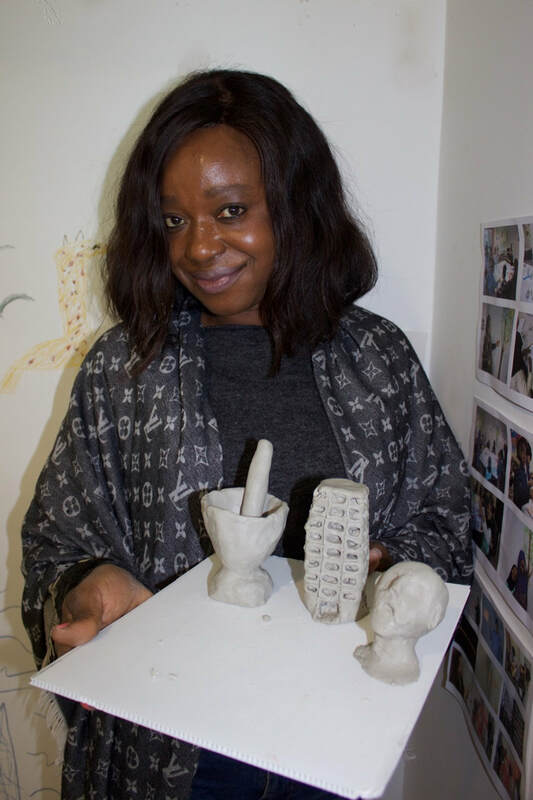 She produced a lovely pestle and mortar and other objects. 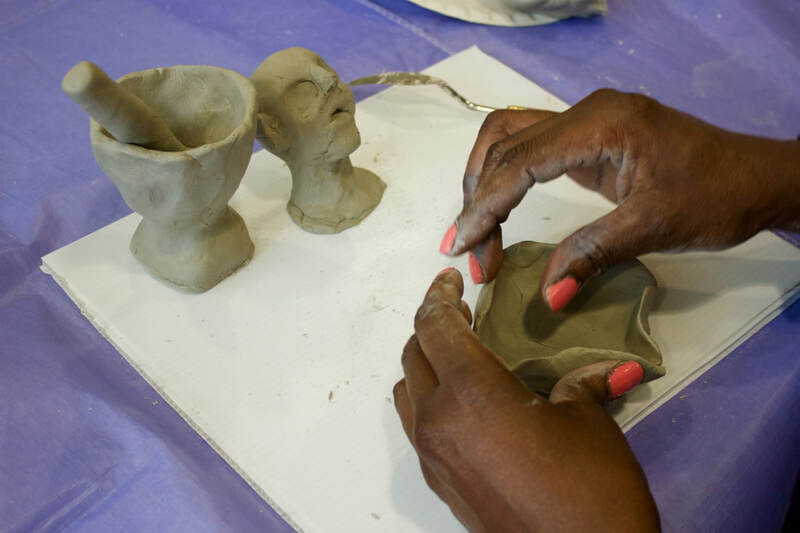 Isiah: "I enjoyed sculpting clay and drawing." 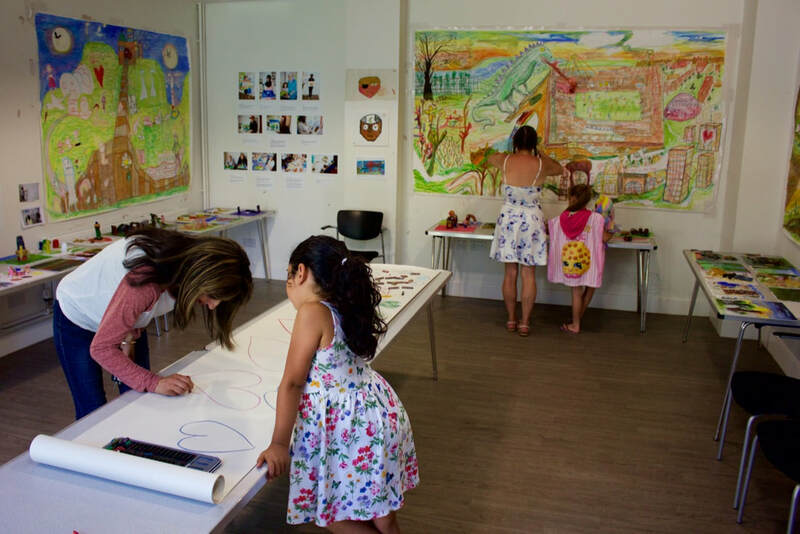 Lina sculpting and leading the children in the large scale drawing. 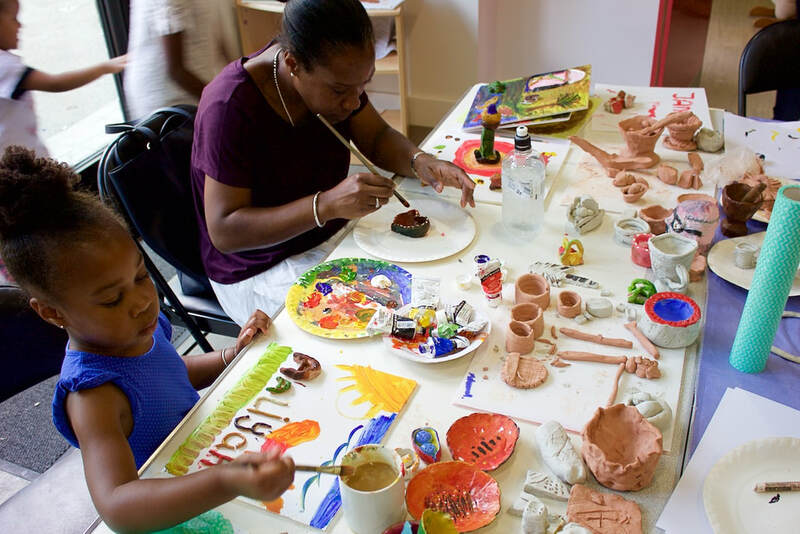 Aaliyah and mum Monica painting their ceramics from a few weeks ago. Great stuff! Ancient Greek mythology in a face off with Japanese B Movies - you could probably only experience this at Silchester Estate, such is the whacky imagination of its residents! We will discover more about this in a moment. 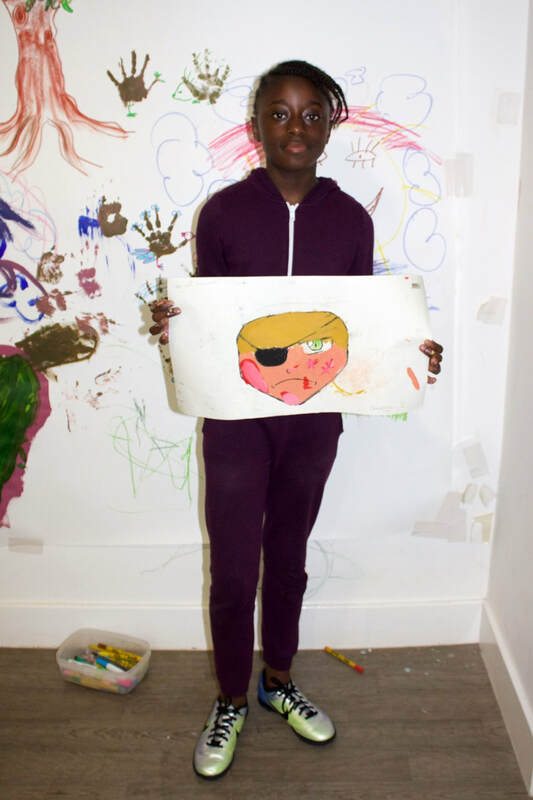 Young Daniel, when he arrived with his mum, Hannah, was very shy and really wanted to go home to play games on his tablet. After some gentle coaxing, we discovered he was a big Chelsea supporter and at school plays as the last line of defence, goalkeeper. 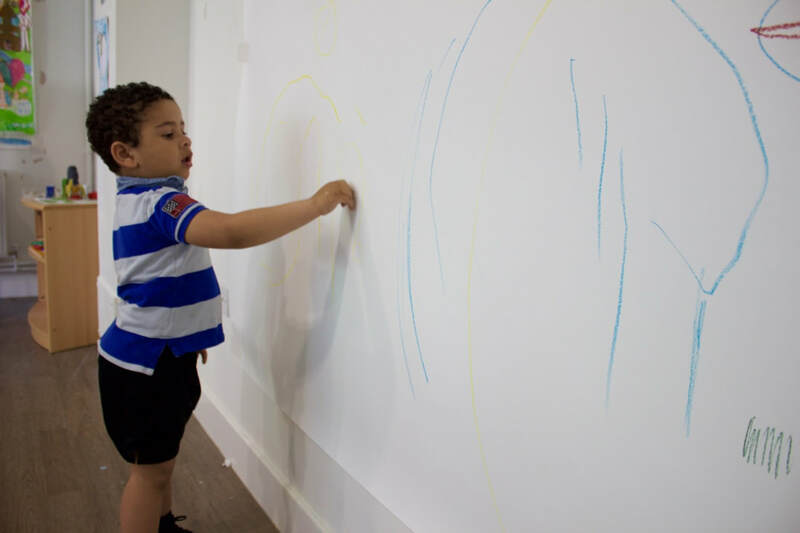 Daniel then started to make a drawing of Stamford Bridge where the old enemy, Man Utd, were about to be ripped to shreds. He asked how long it would take to build a new stadium, as redevelopment plans are afoot south of us in the borough of Kensington and Chelsea. Michael had just arrived with his son, Bertie and as a Tottenham Hospital fan, raised an eyebrow or two about his dreaded enemy. This was laying the seeds for our mythic battle. 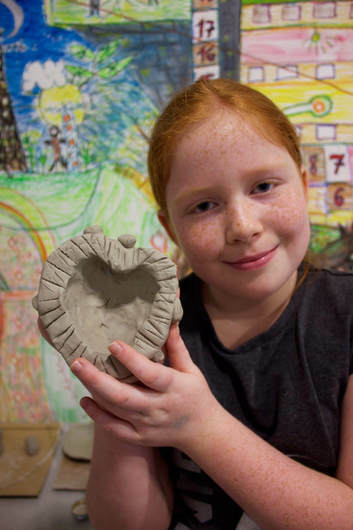 Hannah, who had last used clay as a child at school, thought long and hard about what she might make. 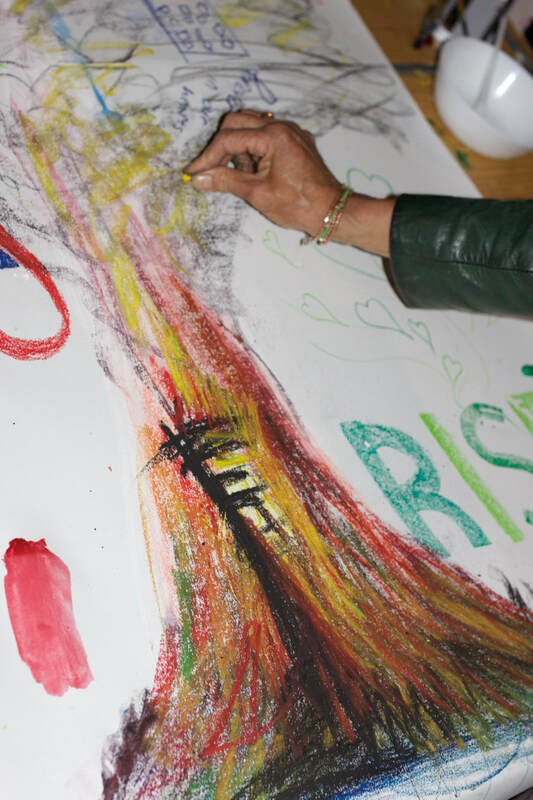 She confided that this was probably the first time she could express some of her feelings about the tragic fire at Grenfell. Hannah proceeded to make a clay woman who was crying. She later wrote the following: "Her tears will never stop. She keeps praying and still asks why. Her baby girl and grandson, engulfed, trapped. They never made it out. The red building swallowed them." It was very moving to hear Hannah talk about this and to express this in her art. We sincerely wish Hannah and her family and friends all the very best for the future. 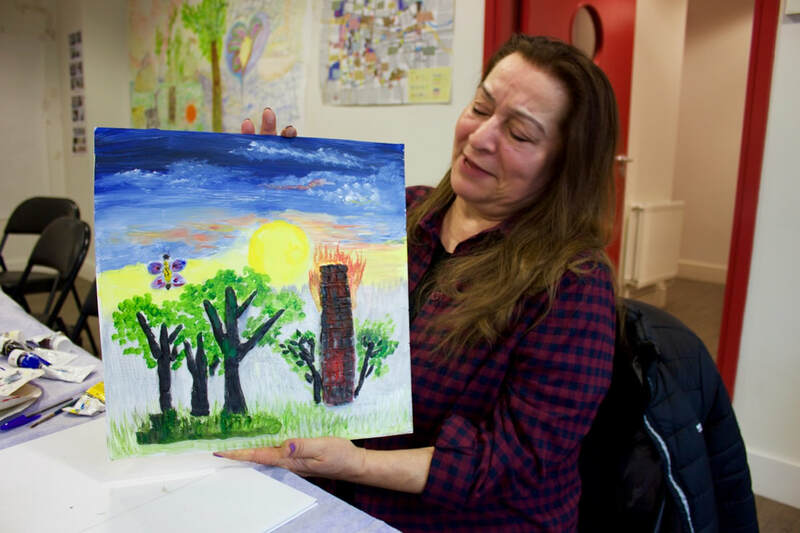 The human spirit has been shaken to the core in North Kensington, but we will always maintain a positive outlook on life. Hannah was able to admire the playful work of her son and, later on, her daughters who joined the session. 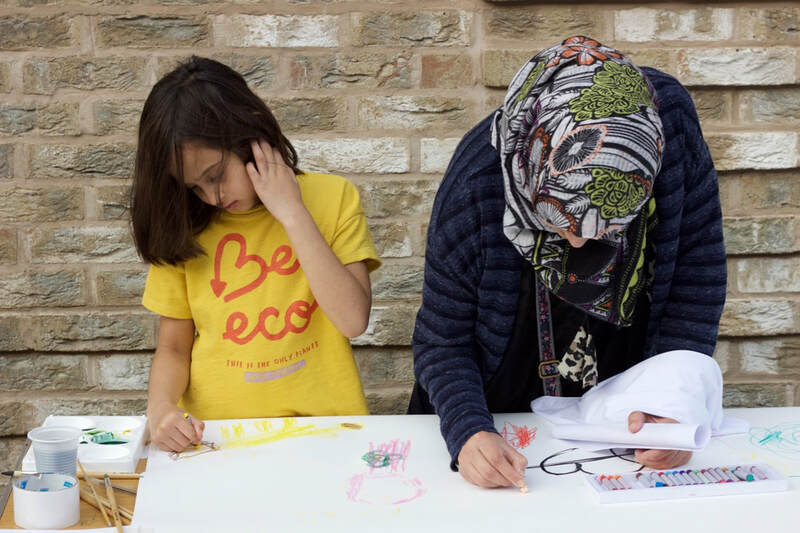 They are all going to make some amazing and powerful art work for our exhibition during Estate Open Garden Weekend on the 30 June and 1 July. 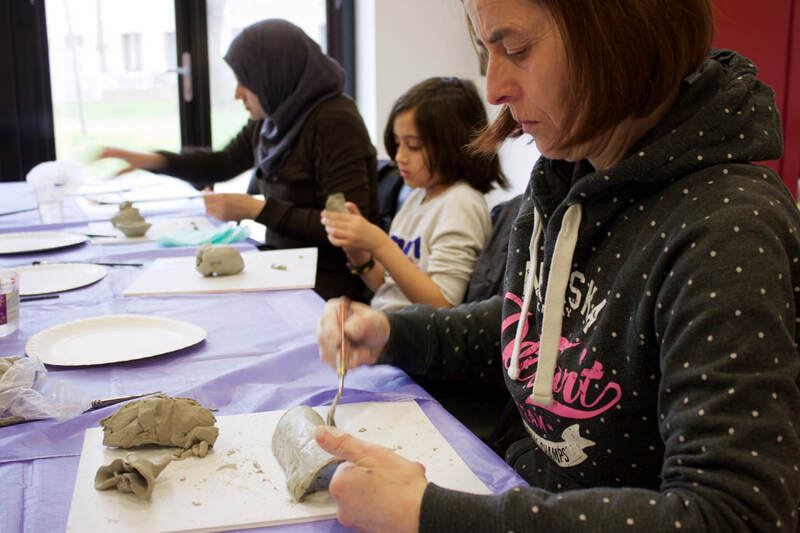 Daniel had now moved over to join his mum at working with clay. He made a charming sword and shield. Have you seen the film Gladiator? No! He is too young. Do you know about Robin Hood who might have had these weapons for self-defence or attack? Yes! But Daniel, then told us that he once had a fight in the ancient Greek arena against the Minotaur. A sword and shield would naturally come in handy on such an occasion. 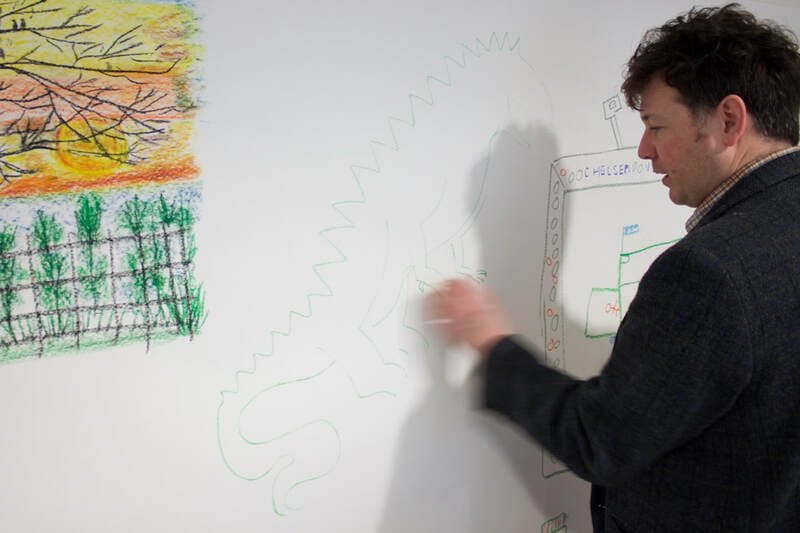 At that self-same moment, Michael was sketching out his fiery Godzilla, looming large over Stamford Bridge. In between these moments of pathos and humour, Nahid created another of her lovely sunset images, this time complete with sonorous birds. 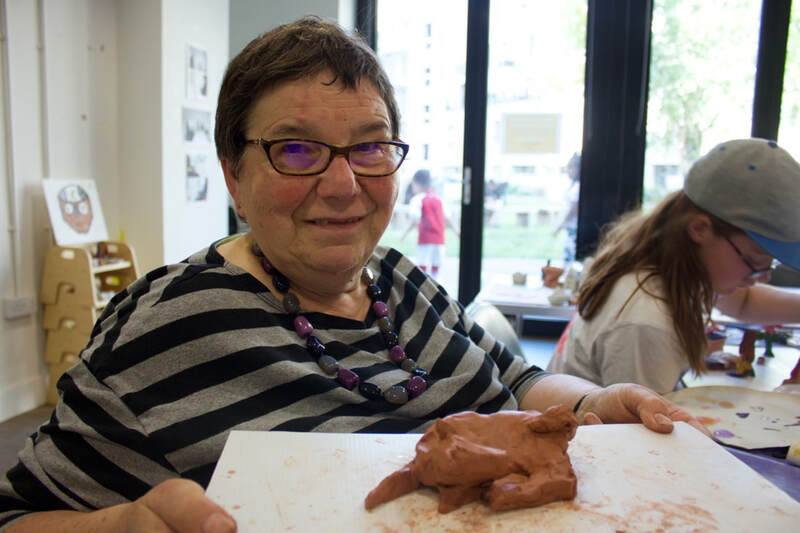 She recalled a particular evening when she was returning from a Town Hall meeting and found comfort in the beauty of Waynflete Square which lies at the heart of Silchester Estate. 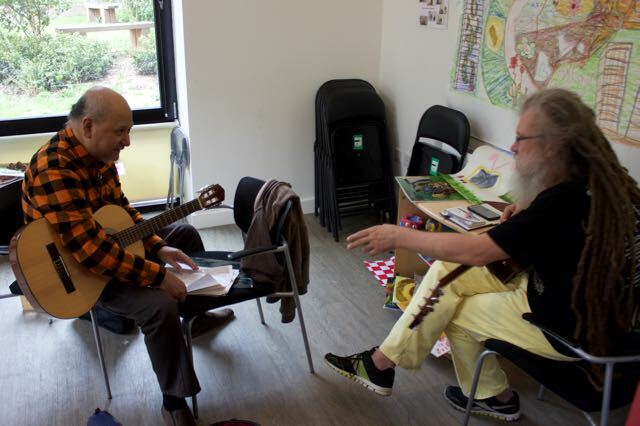 Danny and Jacek, our resident musicians provided another guitar flavoured source of musical backbeat. 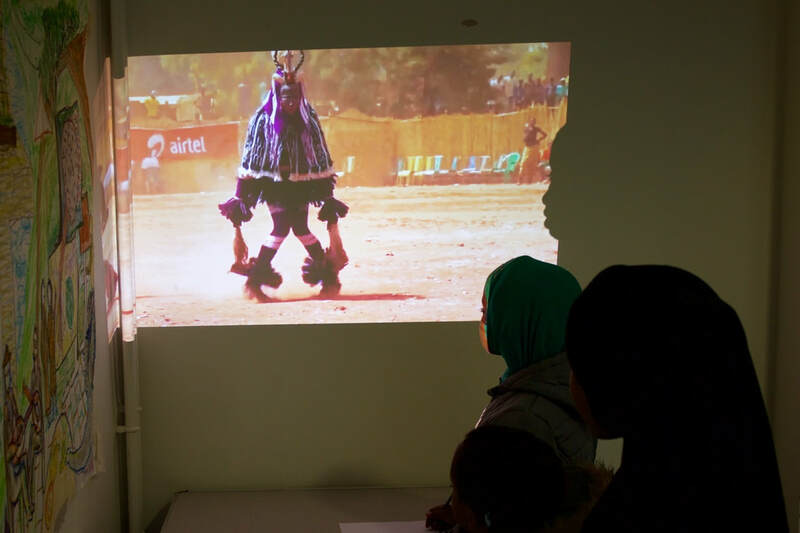 There was also a film programme being projected with dance ranging from Persian hip-hop to Meredith Monk, Gangnam Style to Fred Astaire. 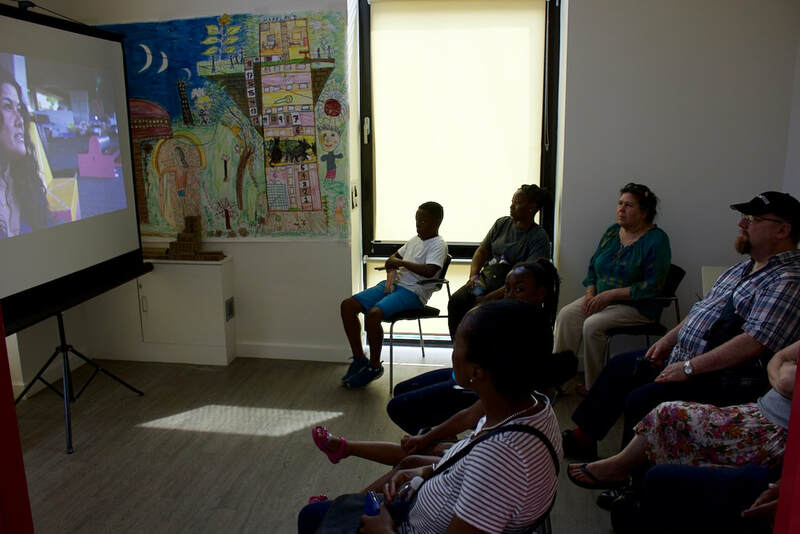 We also showed the work of two choreographers, Rosie Whitney-Fish and Juliana Werner, who have both recently visited Silchester Estate to discuss potential dance projects. 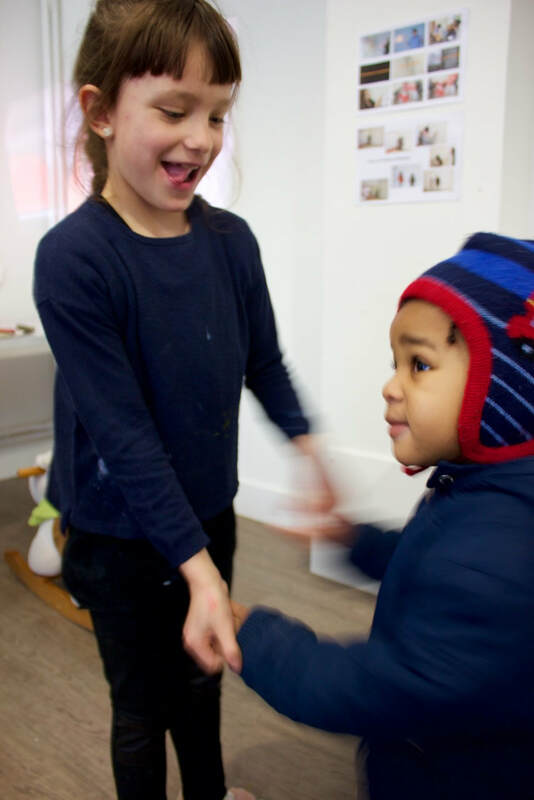 Rosie runs Dance West and we're really excited about upcoming taster workshops in which residents of all ages from 1-99 will be able to experience the joy of dance and movement. These are scheduled to start in late April or early May. Juliana works with the Brazilian dance form of Forro. She uses partner dance to question the traditional role of leader and follower as a part of gender equality. Silchester can certainly update Godzilla and the Minotaur as they dance a tango together! We thank all our residents and the other visitors who added to the special atmosphere at this workshop. 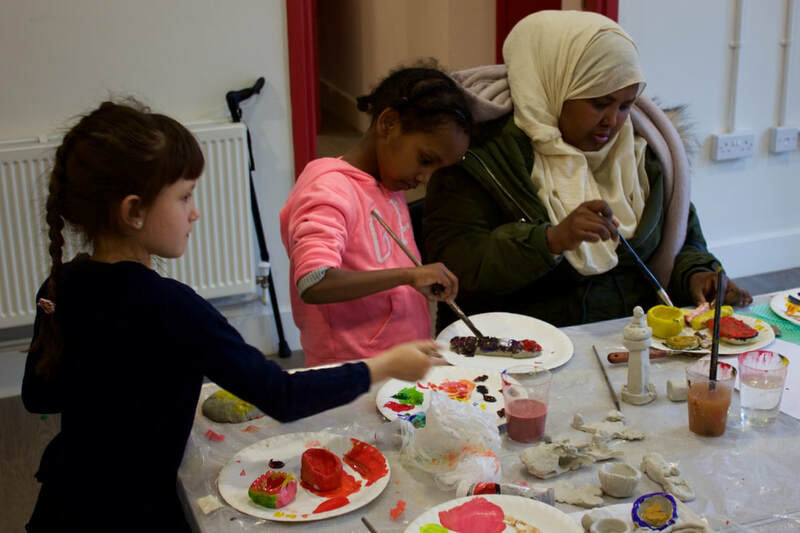 Our next session which will be held on a revised date: Sunday 25th March from 11-2pm. 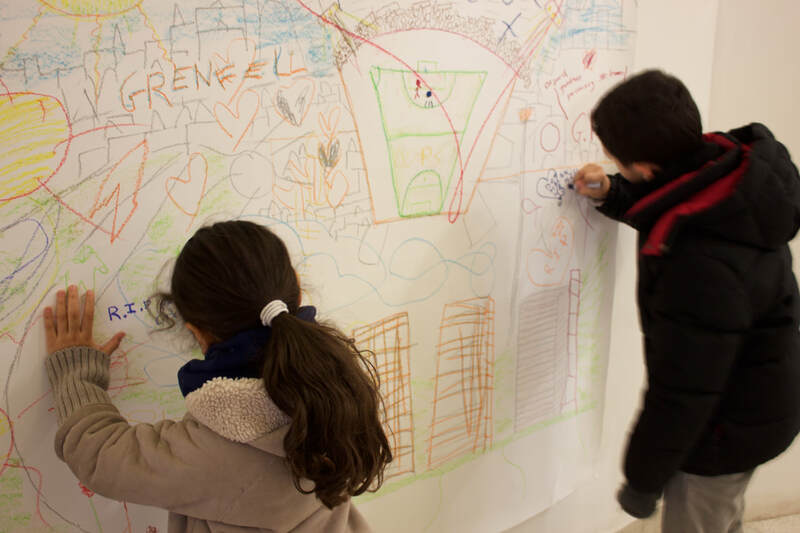 Many thanks to everyone who attended today's session as you contributed to the special atmosphere of fun and creativity. 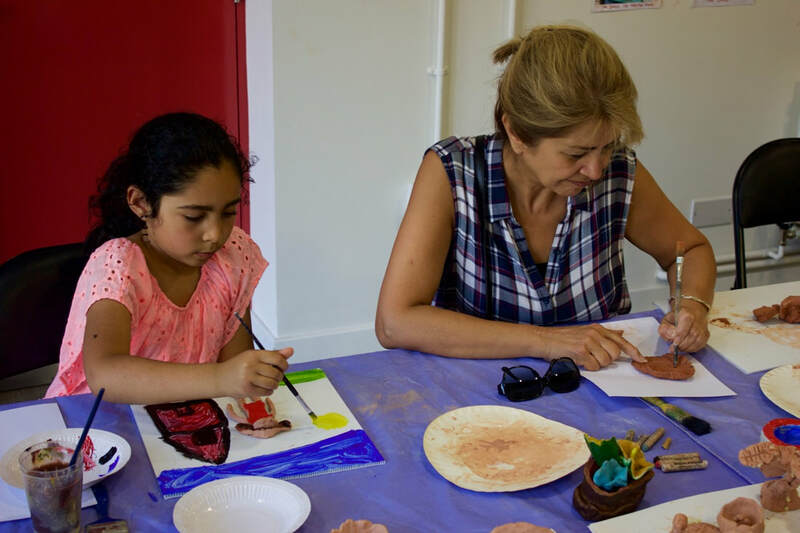 First up, two of our precocious resident artists on the estate, Cerys and Sina, who came back to paint their ceramic objects. 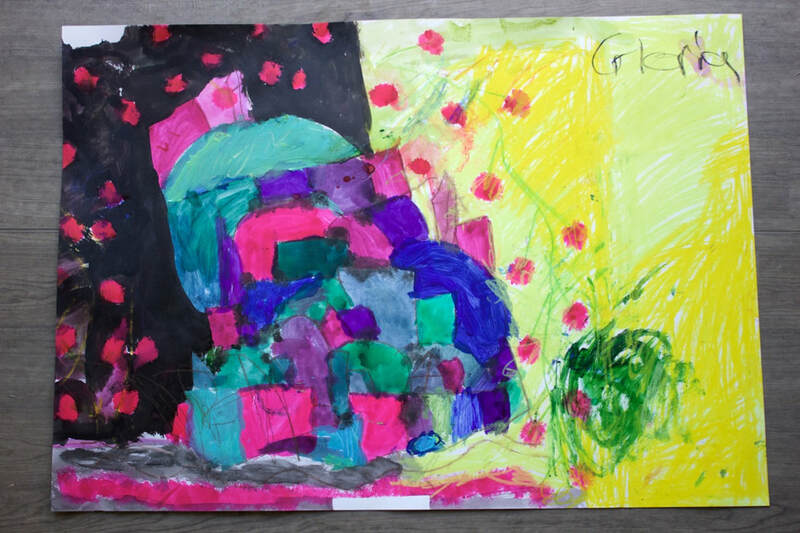 This is how Cerys described her work: "My art piece is based on protecting. It is a peel, for example a banana peel. When it is peeled it is not protected. When it is not peeled, it is protected." 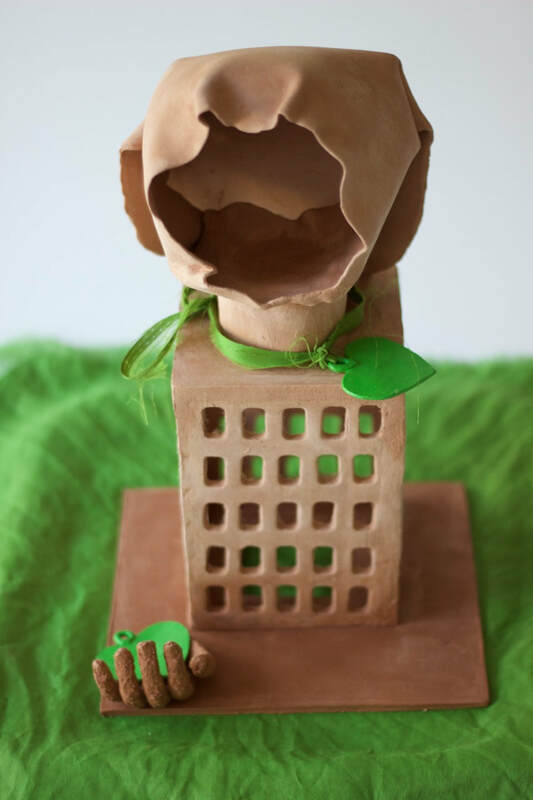 This is a lovely concept for the high rise building she originally made, but with the additional unique fusion of vegetable and mineral elements. 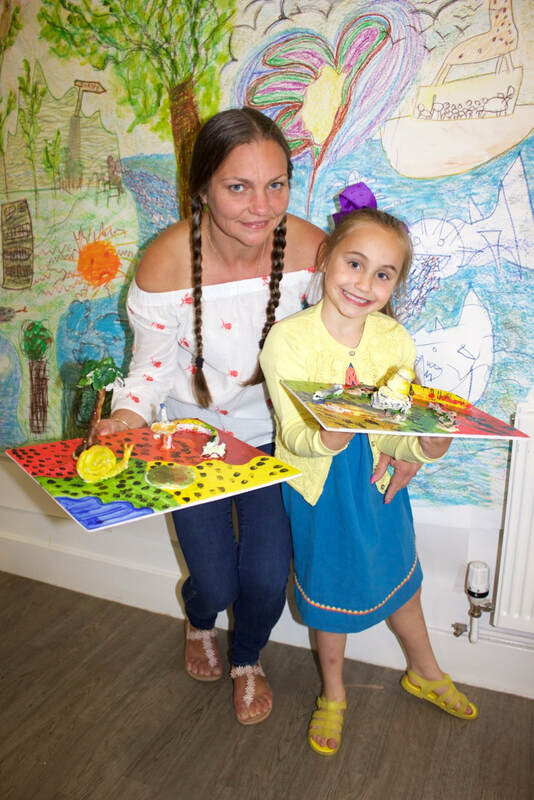 We look forward to more work from Cerys. 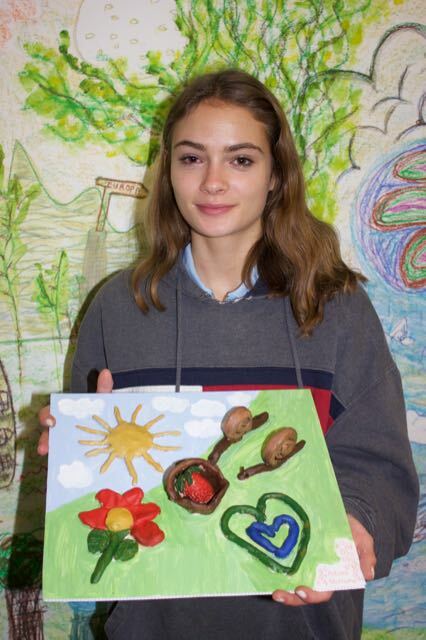 Sina also created a brilliant combined ceramic and painted backdrop: "My art work is a model of our community which is a happy place even though its had ups and downs. I've lived here for my whole life!" I didn't think we could get much better art. But hold on, this was just the start of an action packed session! We had a 1 hour programme of projected dance films in the main room and a trio of musicians in the side room. This was the musical counterpoint to clay making, painting and drawing. 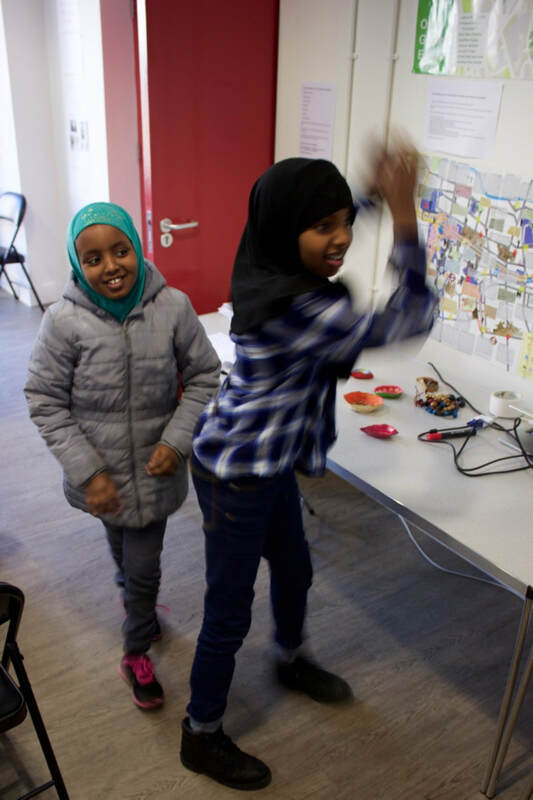 The kids were even inspired to try out some of the dance moves on show ranging from hip-hop to Persian. One child marvelled at the skills of dancer Dave Toole, who lost both his legs as a child. "I really like art. I express my feelings and I draw what I like." "It's been an amazing experience seeing all the children being so creative and socialising." 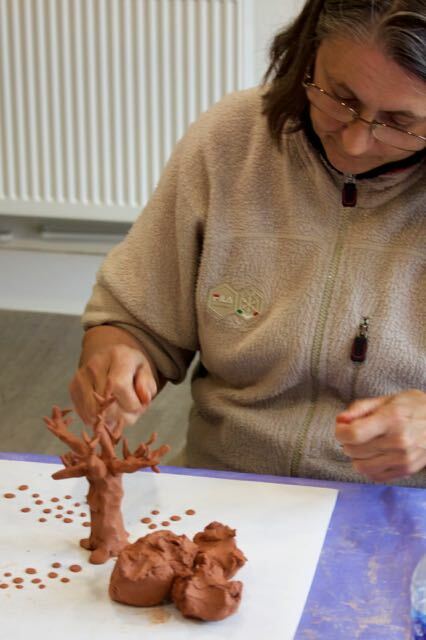 If this looks appealing, please come down to our next workshop on Saturday 10th March from 11-2pm. In the coming month, we also look forward to taster dance workshops from DanceWest, the community dance organisation for West London. 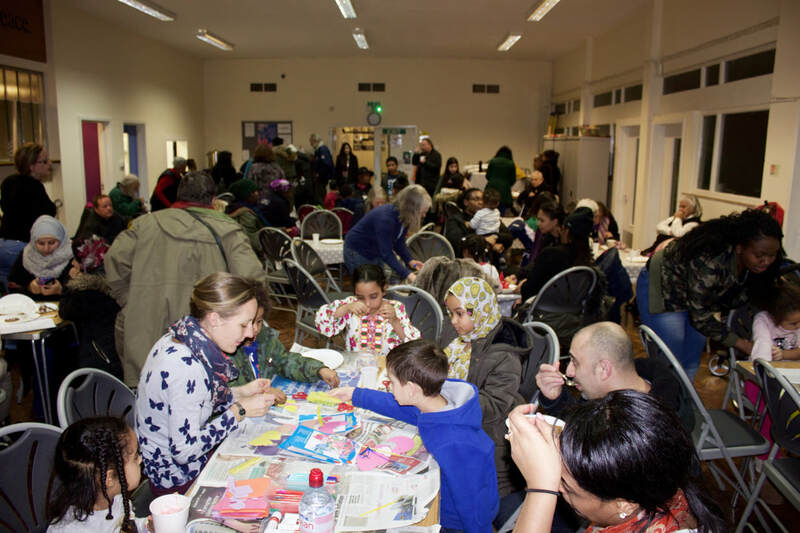 This was a pop up drawing event that took place at Latymer Community Church on Shrove Tuesday. 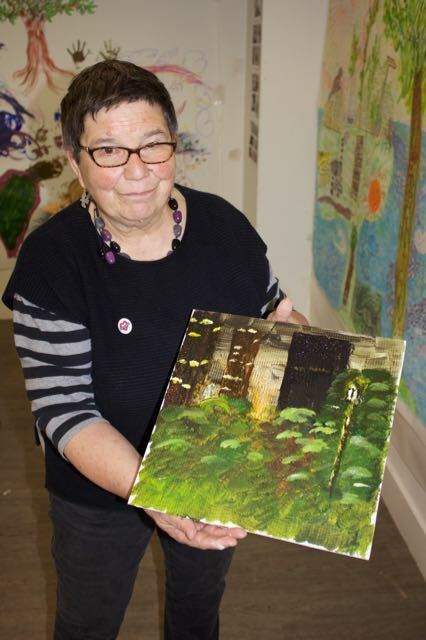 We took our Silchester art out of the estate and into the packed hall of the church where there must have been well over 100 people in attendance. 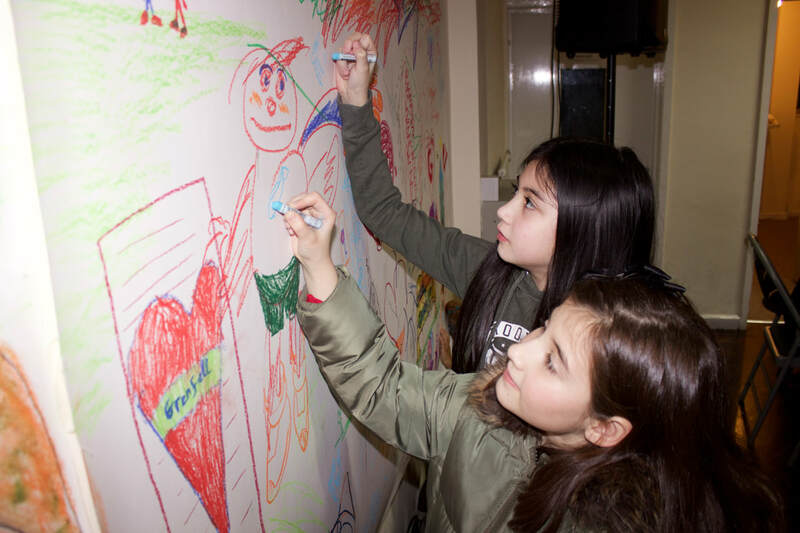 In addition to the free pancakes and drinks kindly provided by Mary White and the dedicated volunteers, and the other craft and magic acts, the local residents of the area were treated to a live drawing. 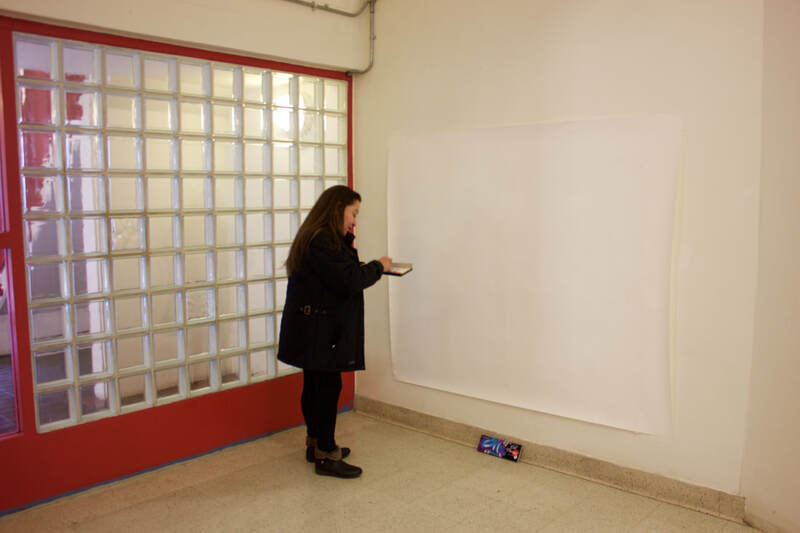 We had a tentative start as that blank canvas was set up on the walls facing everyone. 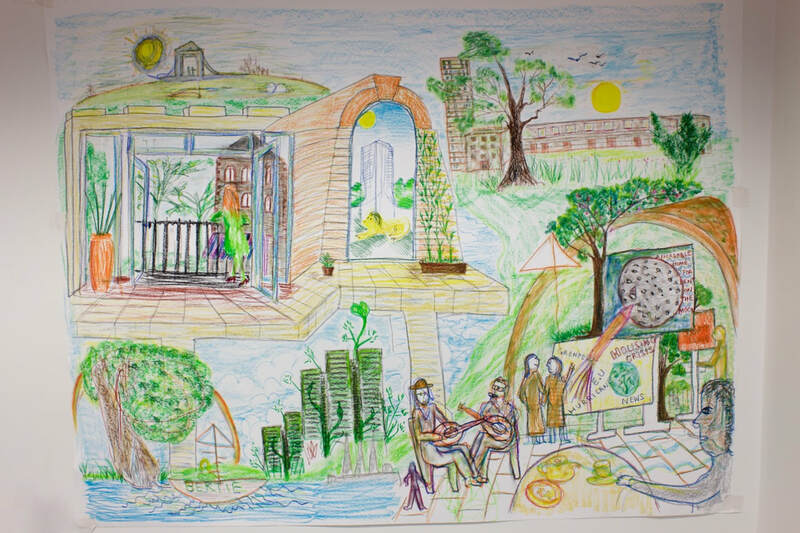 Next to it was a lovely drawing already completed and which we wanted to add a panoramic section. 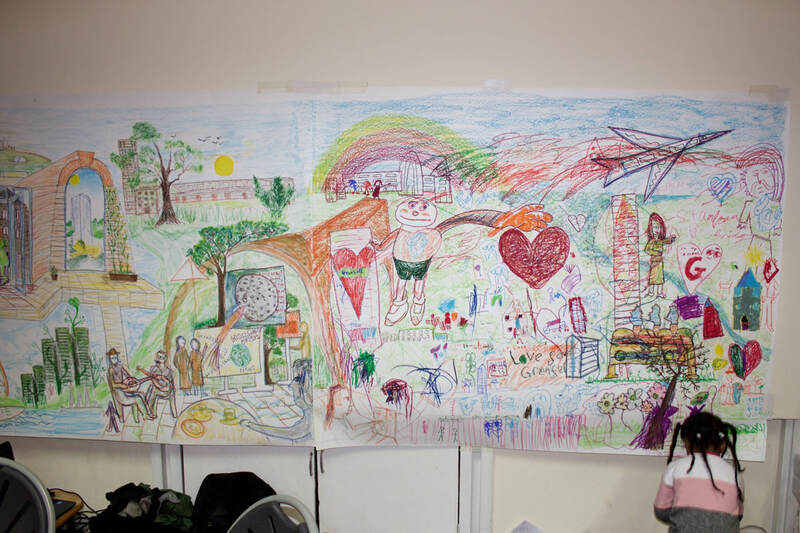 Incidentally, this is the largest ever drawing we have attempted: not sure where we will display this on the estate, but that's a challenge for another day and perhaps al fresco options might be available. 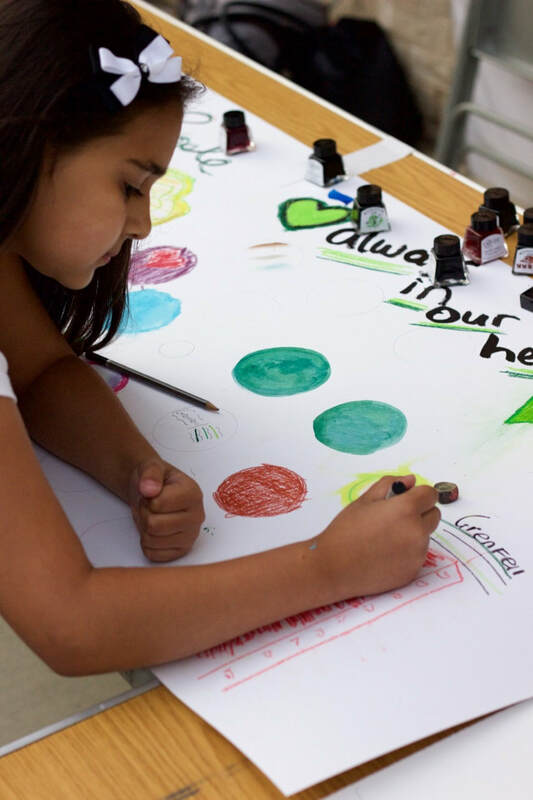 Many of the children wanted to show their respect and love for the survivors and bereaved of the Grenfell tower fire. That was very poignant. Especially considering that just outside the Latymer Community Church is one of the public memorial sites with condolence messages from the public. There is a debate taking place at the moment about how best this can be preserved. 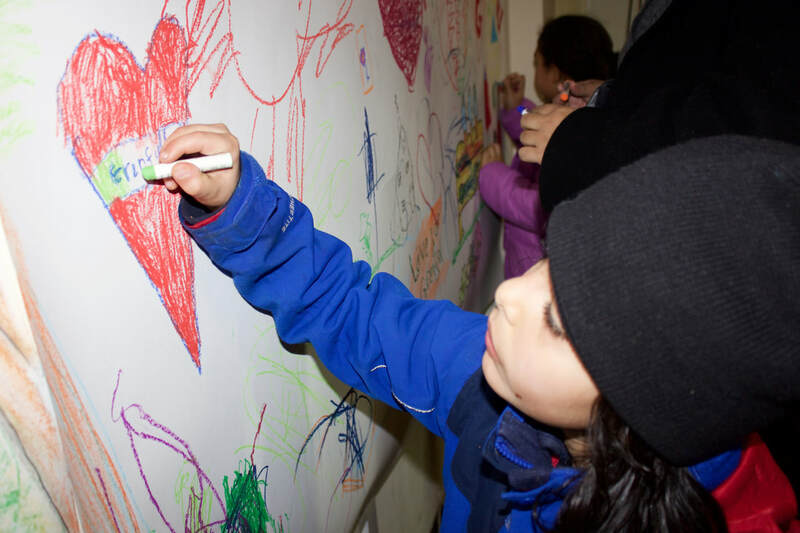 We thank all children and adults who left their thoughtful and creative mark on our drawing. Also for LCC staff for organising this event for the local residents. 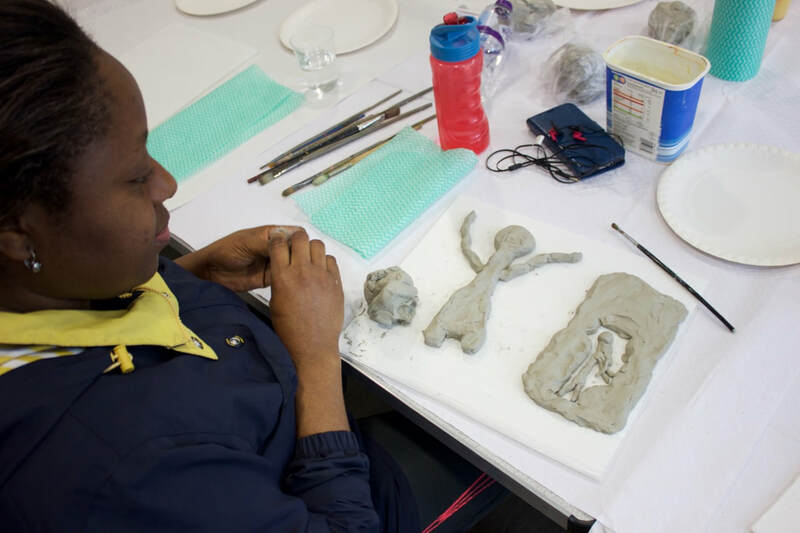 Clay Play at Silchester Estate from Constantine Gras on Vimeo. 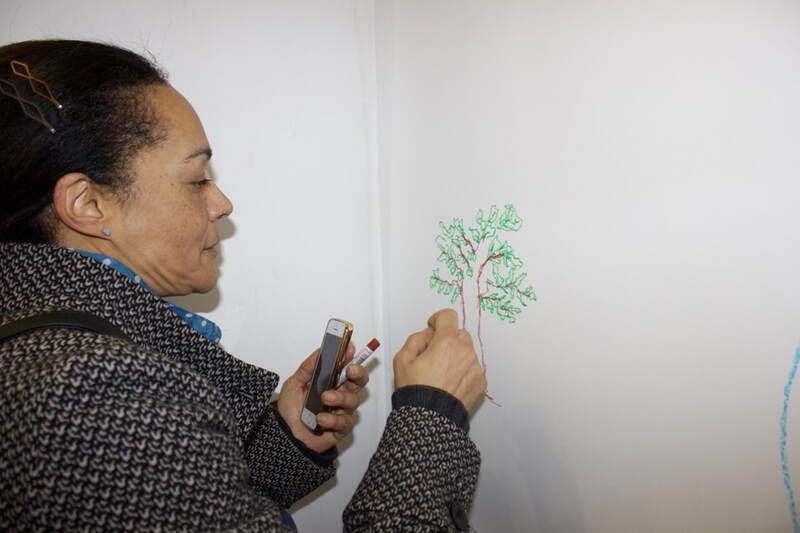 At this workshop we had over 20 residents attending from all across the estate: Markland House, Whitstable House and Frinstead House and also adjoining neighbours at Bramley House. 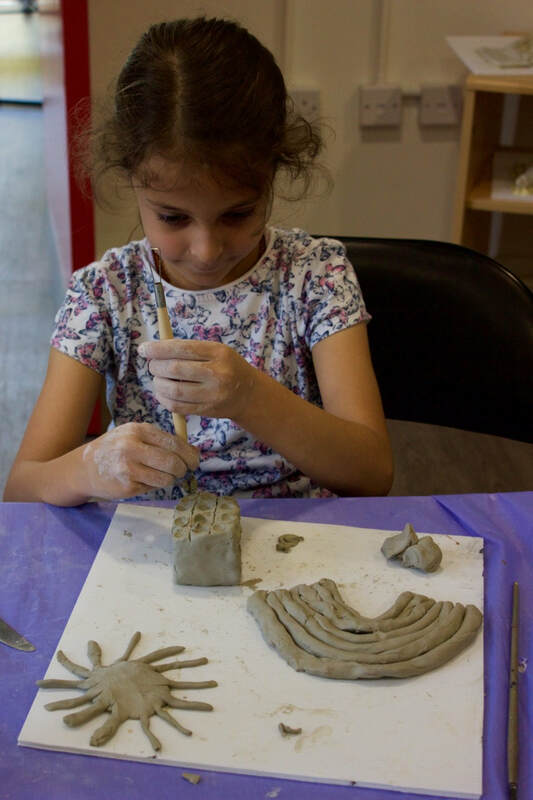 They had fun playing with clay and also combining this with drawing and painting. It was a great hands on experience that required a thorough washing of hands and dusting off of clothes at the end of the session. 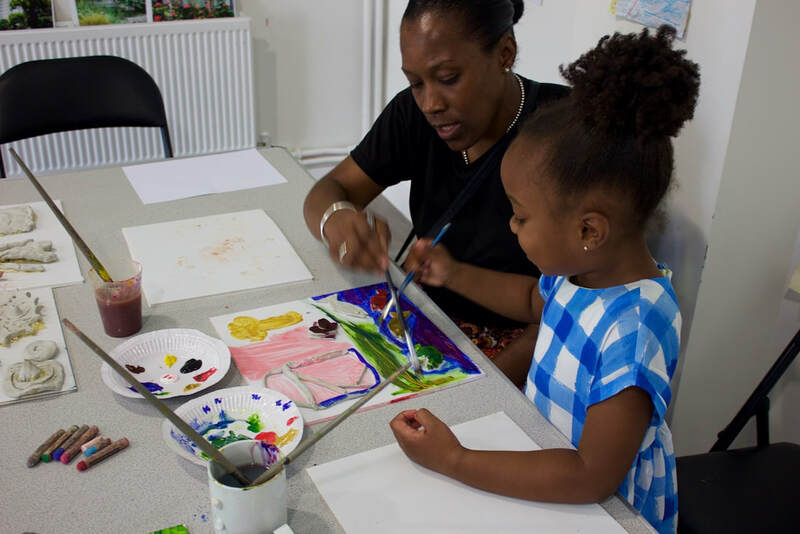 Lovely to see parents leading by example and showing their kids the patience and discipline needed for making art. 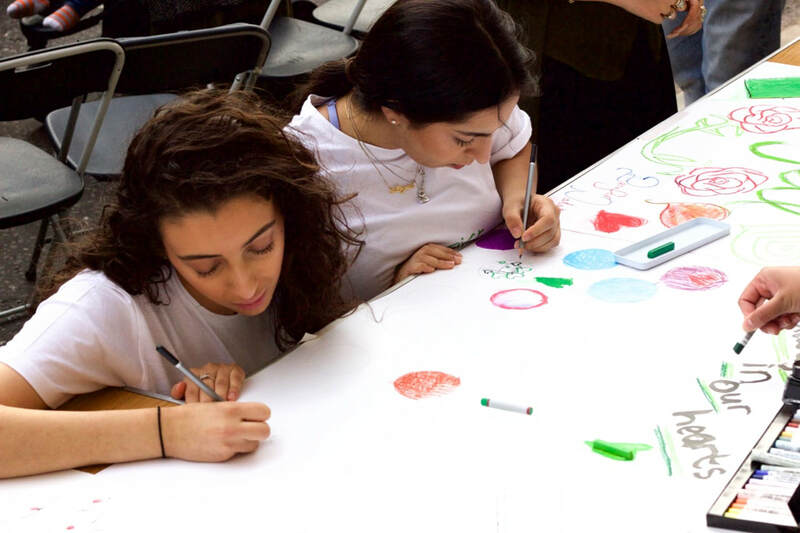 The kids in turn could show their elders how to be freed with self-expression. 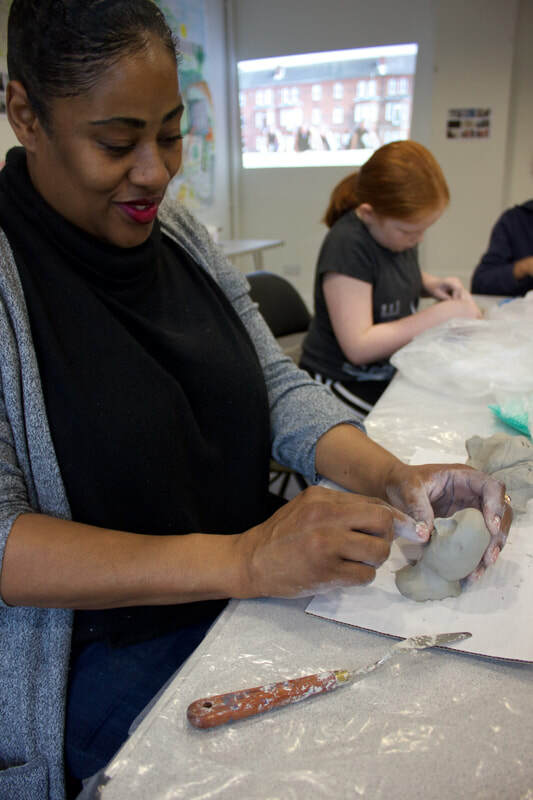 We had some great shapes being formed in clay that included flowers and rainbows, houses and cars, a person wrapped in a blanket lying on a bed and the ubiquitous bowl. Hopefully we can put these all together into a ceramic installation. 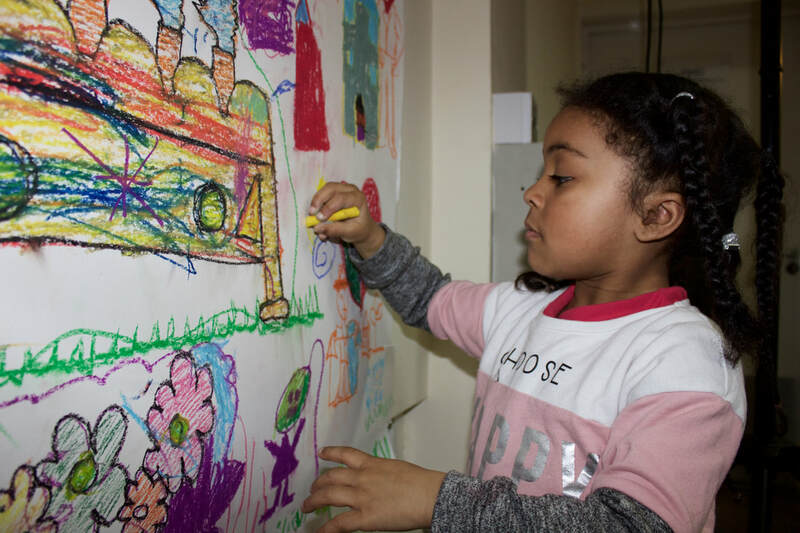 The large scale drawing is also nicely taking shape with all the key locations around the estates being added: Latimer Road station, Bramley House and Buggsi's supermarket. 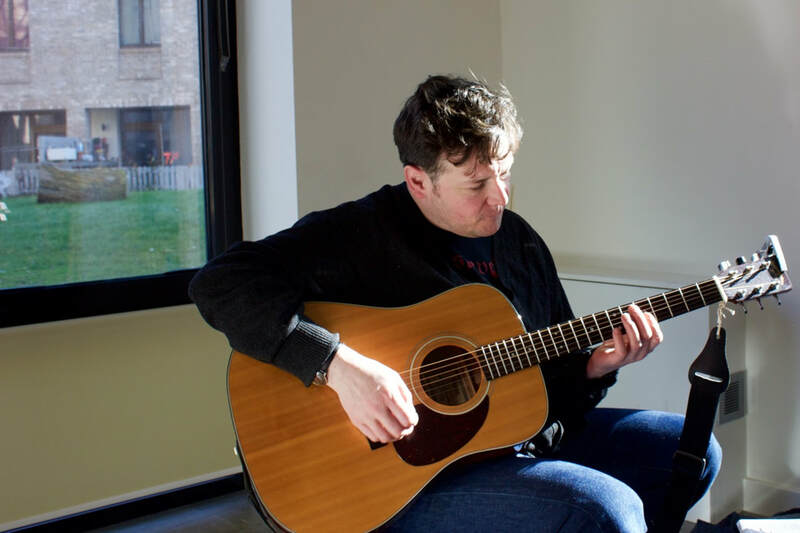 In the adjoining room, our estate musicians were practising their chord changes and also allowed the children an opportunity to bang a drum and strum the guitar. 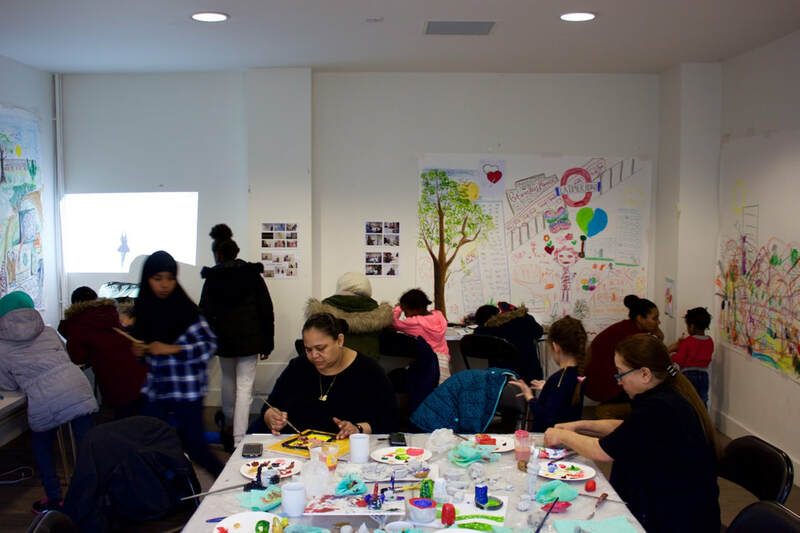 We look forward to building on this body of work at the next session that will be held on the 24th February in the Residents Room from 11-2pm. 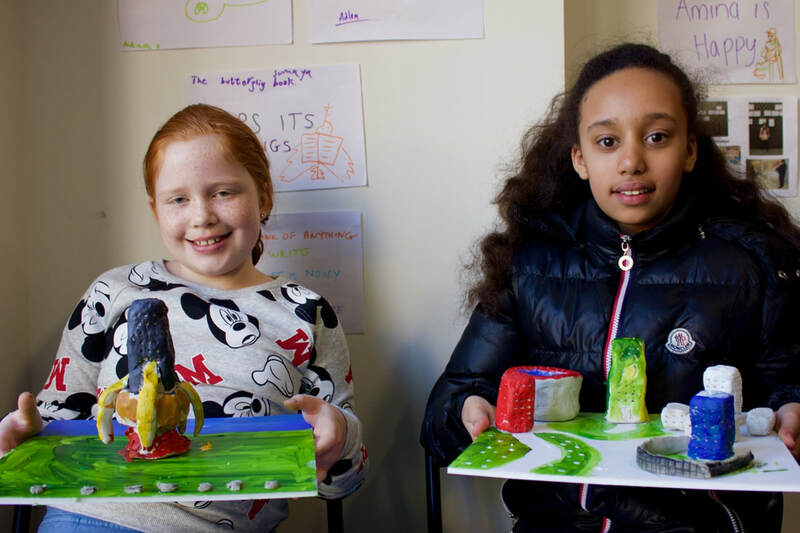 Cerys and Sina creating a landscape in which "You'll float too." 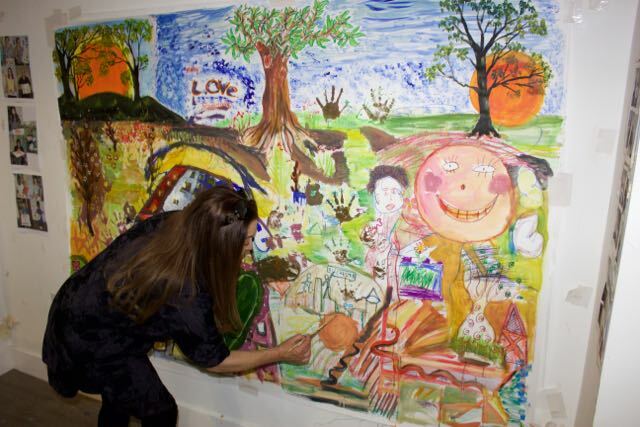 Nahid Ashby on We Love Silchester: "Another beautiful art piece, produced by Silchester residents last week, when residents had a chance to get a couple of hours of respite and escape their pain, trauma and everything that has been causing them much stress, in the last several months. Good company, great engagement and fantastic talent all around. Well done to all who helped create such a comforting and enjoyable atmosphere while producing such an attractive work of art." The Sound of Silchester was a musical and art happening staged at the residents room, Frinstead House on 13 January 2018. 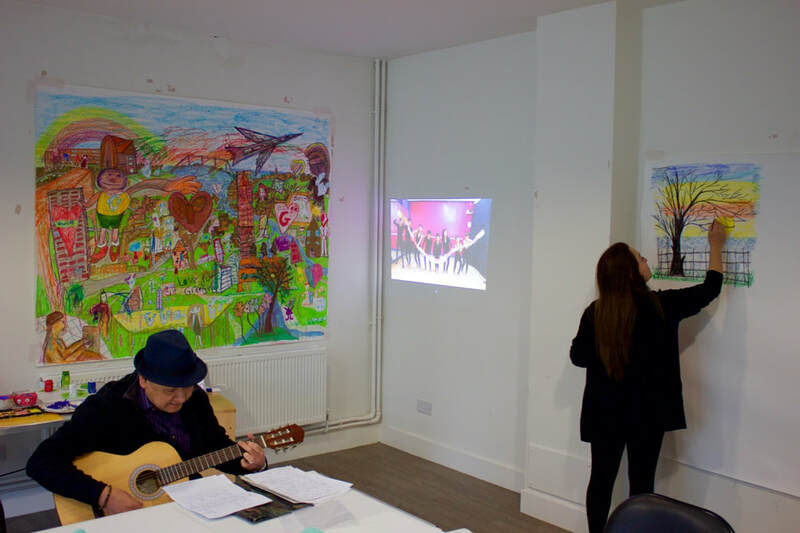 Older residents might have a sense of Deja vu as Feel The Groove was held in a former council house on the estate in 2015. 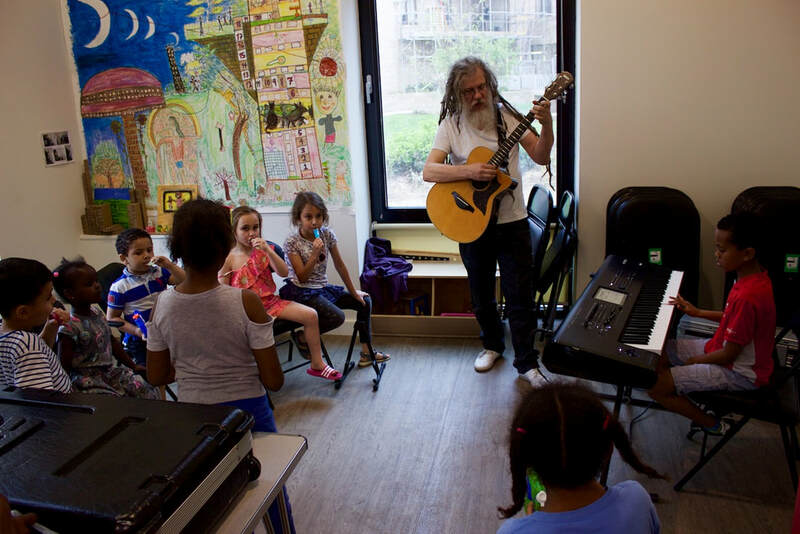 Constantine Gras introduced some of the musical and art rhythms that will shape his residency on the estate. While we all had fun, there was also the opportunity to talk political shop and share knowledge. 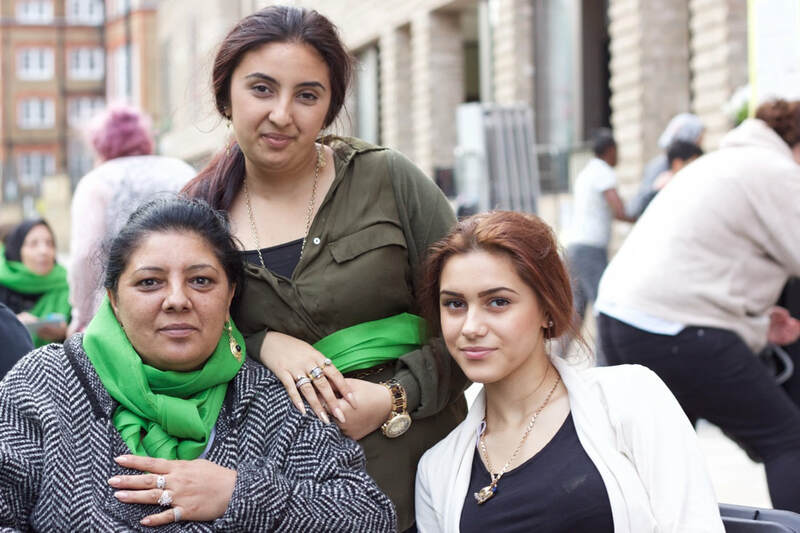 Samina from Angels 4 Grenfell dropped in for a chat and shared leaflets about the resident-led initiative she has set up. 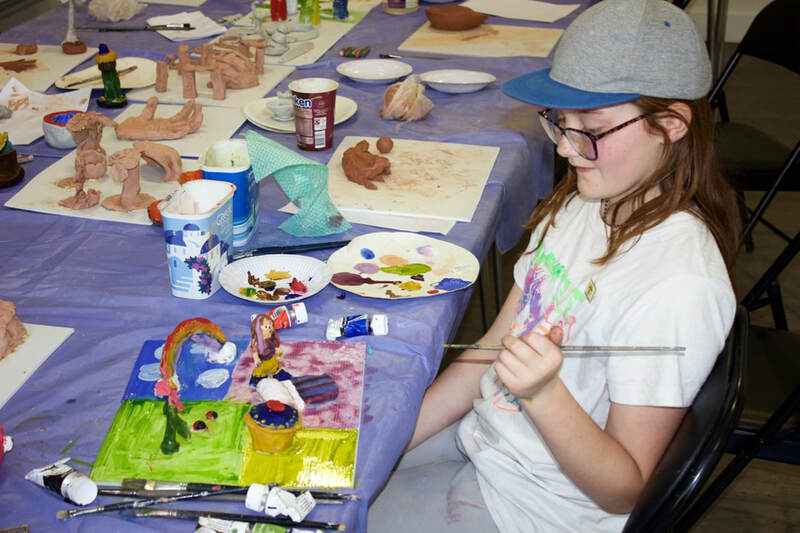 This is a great resource for local people and we have our eye on the art room with a kiln. It was also a pleasure to meet Toby Laurent Belson who is working on a wonderful scheme to build on the success of last year's lighting up of Trellick Tower during the Notting Hill Carnival. Hopefully over the coming months we will see 8 high rise blocks in Hammersmith and RBKC given a temporary green lighting installation that reshapes how we perceive our urban environment. Piers Thompson, DJ, who is co-ordinating the arts network in the area, passed on a mischievous archival story from the early 20th century that fits into the radical pattern of social history that this neck of the woods is well known for. A group of chimpanzees had escaped from the confines of the zoo and were holed up at Latimer Road railway station.They then pelted passers by with an assortment of objects before being rounded up. This requires more investigation and possibly artistic rendering. Danny chatted about the musical culture of Thailand and his former life as a professional drummer. 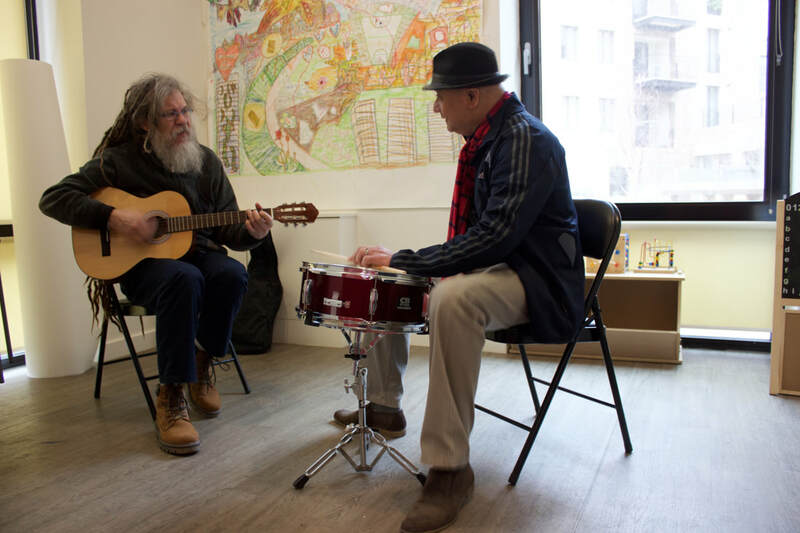 After a hiatus of 40 years, he is banging his drum again and has just traded in his guitar for a snare. Danny really connected with fellow resident, Michael. They doubled up on guitar, providing a haunting fusion of Elvis-tinged vocals and bluesy harmonica harmonics. 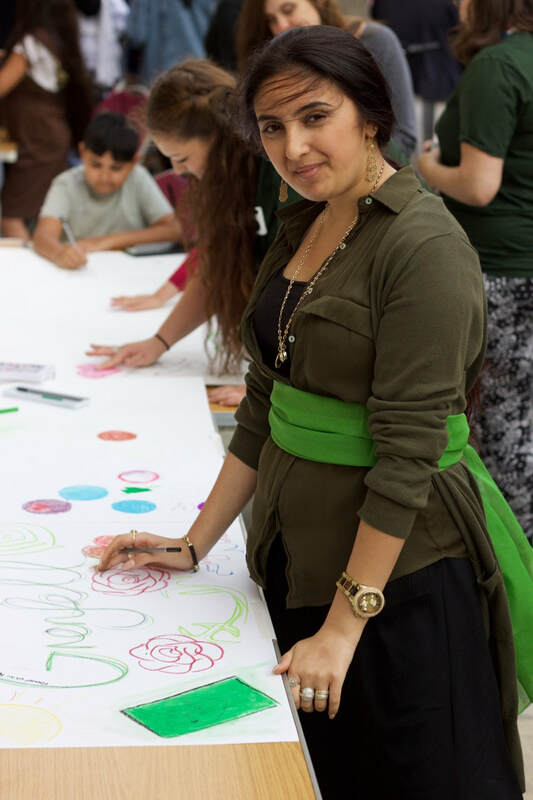 Nahid was able to introduce some nifty finger-clicking beats from her Persian culture. 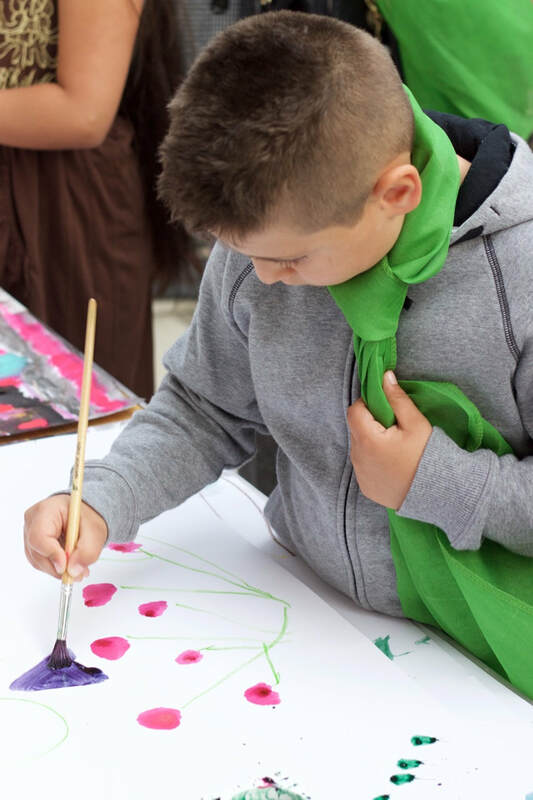 Michael's three year old son, Bertie, after a shy start, joined in with this creative free-for-all. They all provided a lyrical back beat to the drawing that was unfolding and which expressed a vision of place running from arcadian fields to a romantic view as seen from a high rise window. 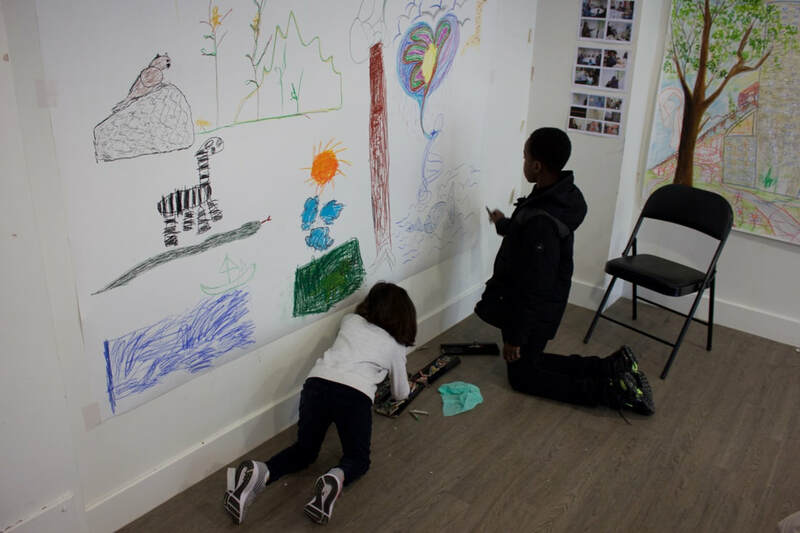 ​Later on in the day, an art session was held at Markland House. 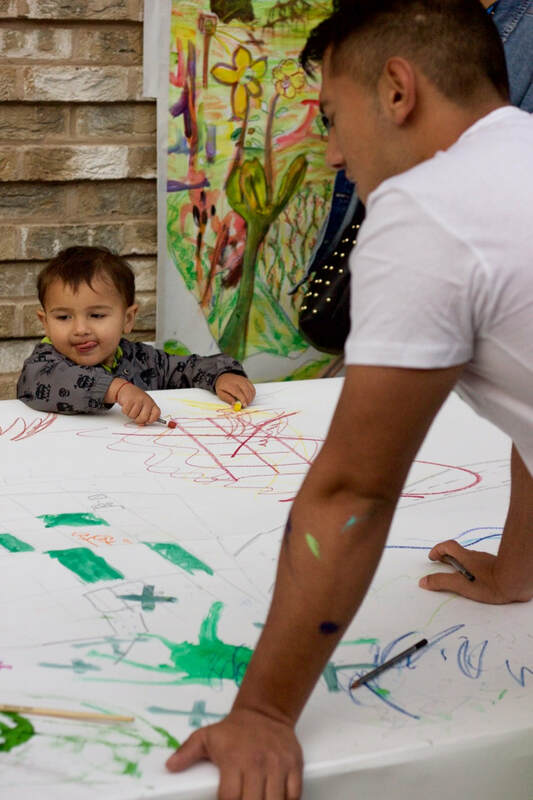 Residents had an opportunity to meet Constantine and get inspired for future art workshops. 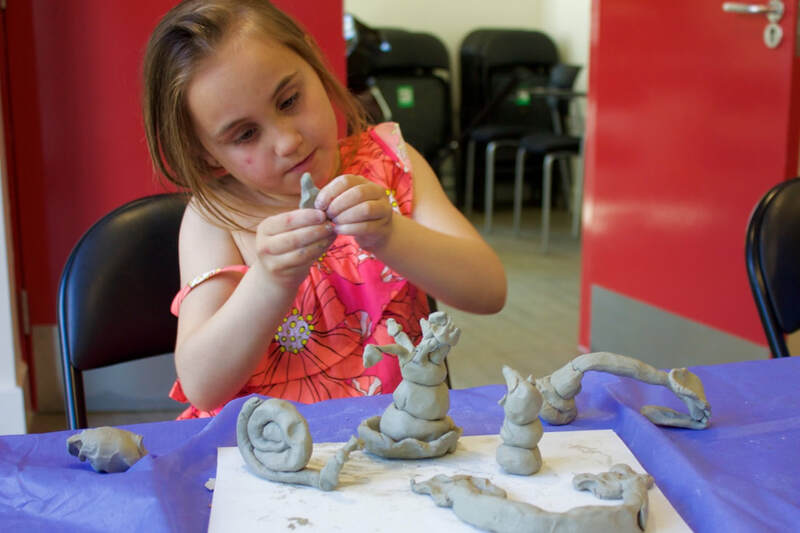 The chance to work with clay is proving popular. Watch these spaces for more exciting happenings! 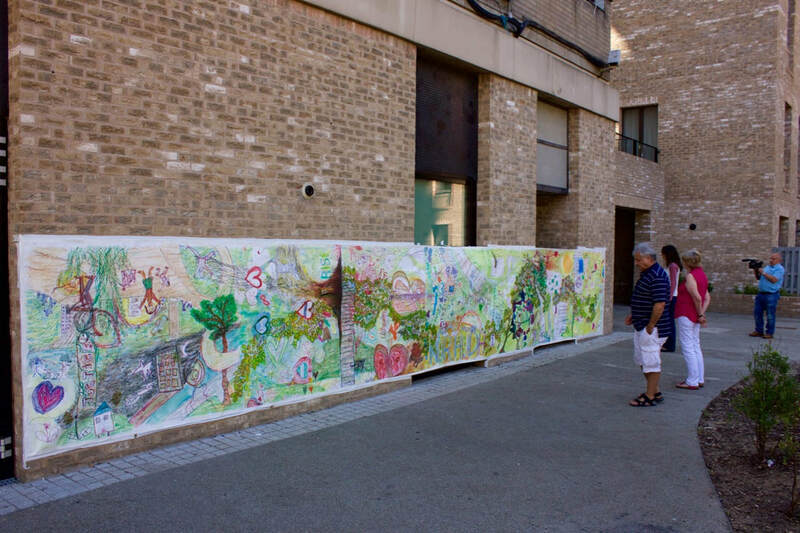 This is the first completed large scale art work made by 13 residents of Silchester Estate. 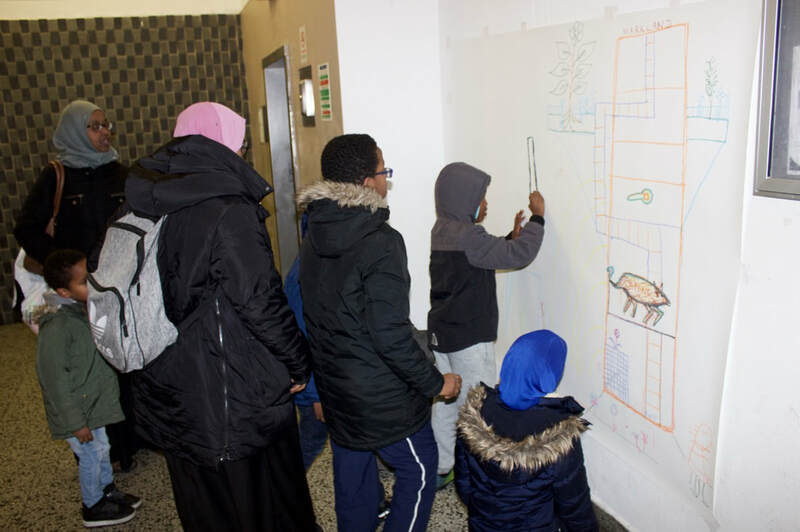 A blank sheet of paper was set up in the lift lobby of Frinstead House and occupants of the tower invited to participate in the drawing. 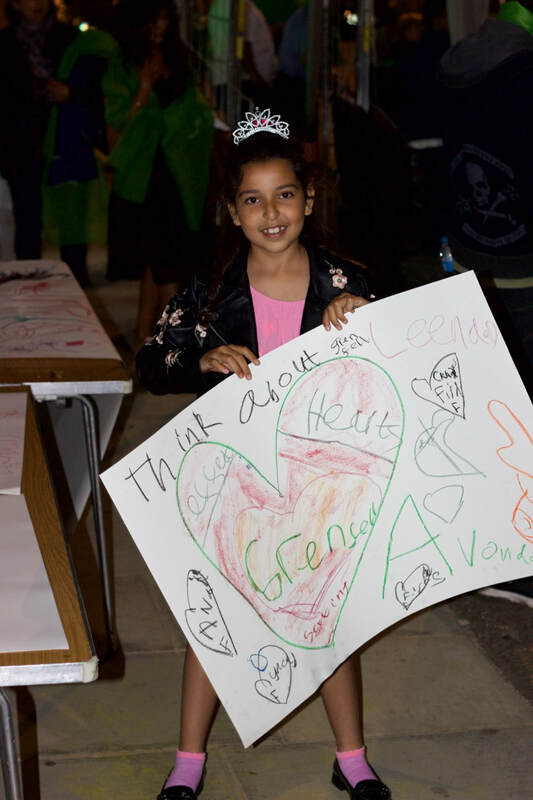 Children wanted to express their feelings about Grenfell fire, with one child remembering their friend Malak Belkadi. 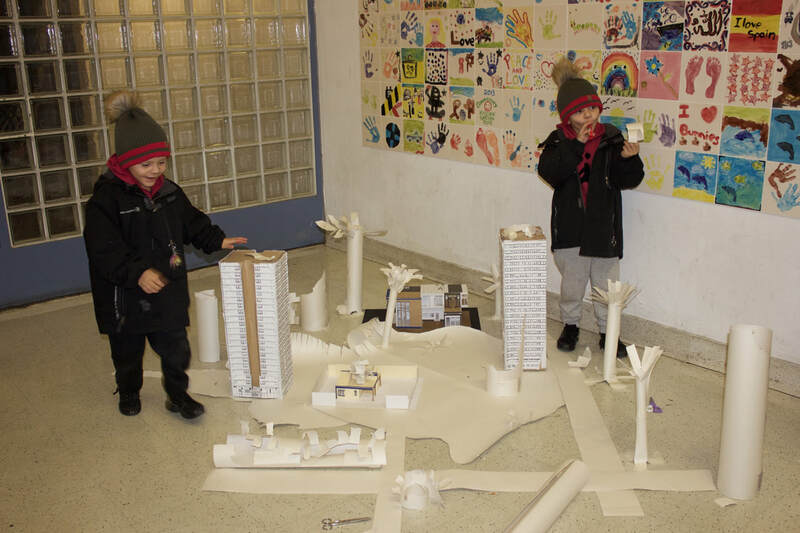 There was also a desire to draw out the high rise structures in which residents proudly live. 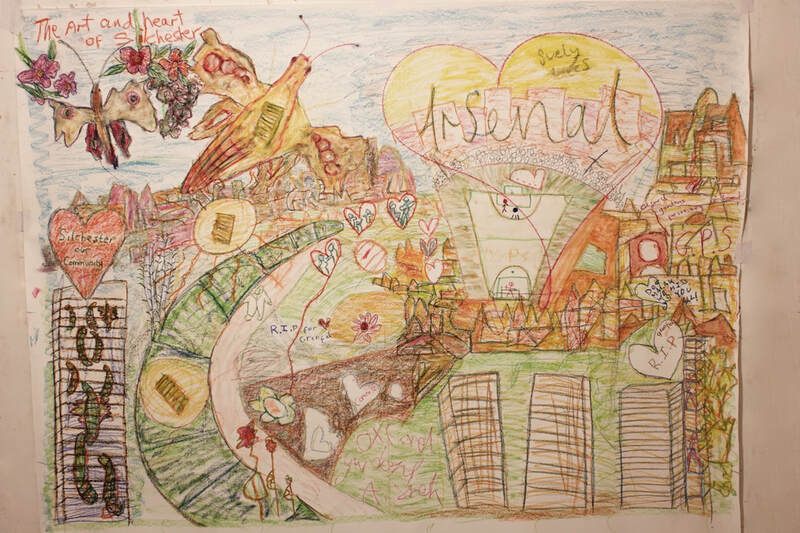 Adults contributed images of green spaces, butterflies and the Arsenal football stadium. Oxford Gardens primary school was also sketched in. The background colouring was added by Constantine Gras. 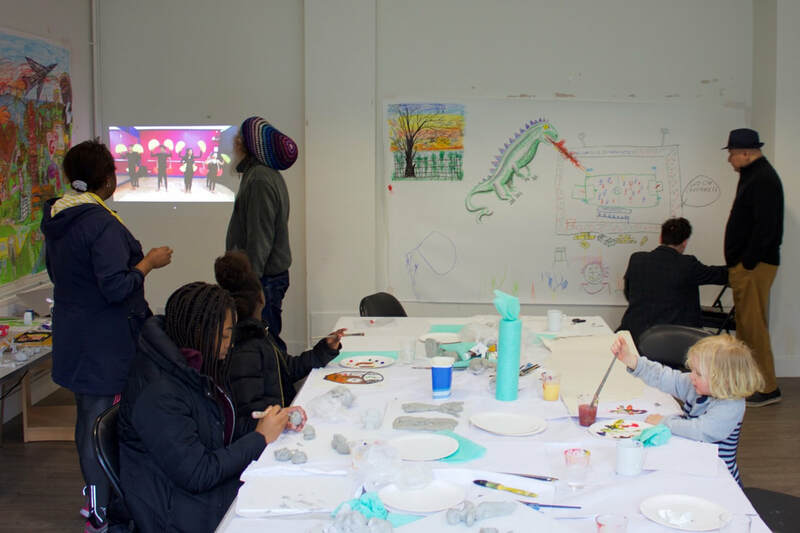 The following photos are from the first pop-up workshops run on 2 December 2017 at Frinstead, Dixon and Whitstable House. The Butterfly Book that Sumaya read this morning flaps its pages in her imagination. 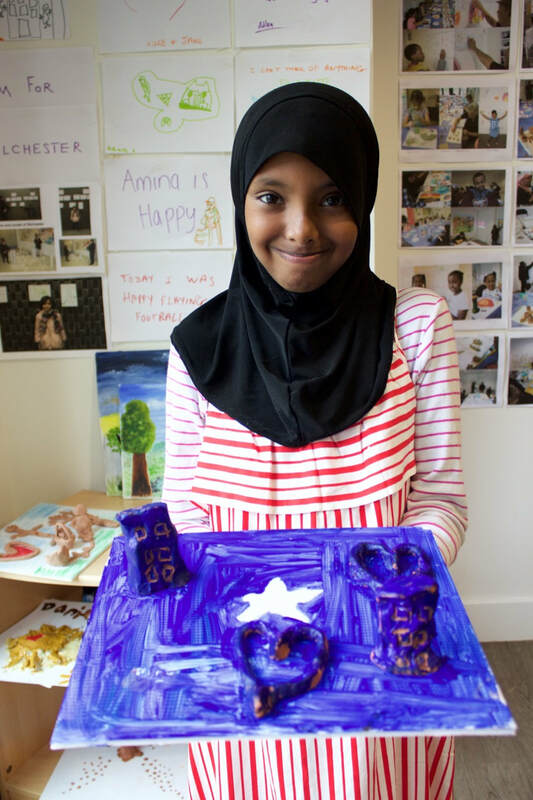 Amina (after her neighbours translated what the artist was asking) declared that she is happy. Jane and Luke who was carrying a new TV, made a declaration of unity and hope. Ruben T was proud because he had been out running for over 20 minutes. A mother and her two teenage sons stopped for 5 minutes and had a good old chat. One of the boys had lost a friend in Grenfell but didn't really want to talk about this. The mother said you boys must have plenty to say, but they were shy of this strange situation. 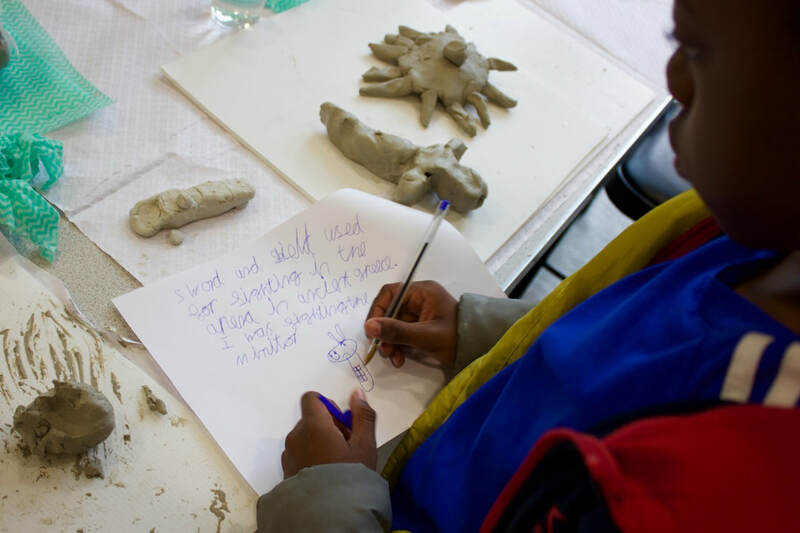 An artist asking them to contribute a thought to a poem that was being visualised. The four of us decided to note that the lift was somewhat noisy. The mother described it as someone dragging a heavy piece of furniture. A boy rushing into the lift had been out playing football. Erjon was back from a fade haircut and looking smart. 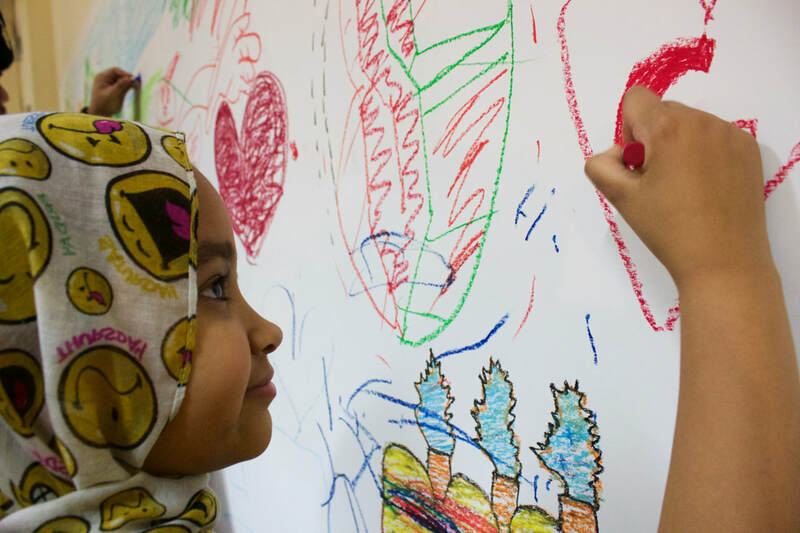 We end this poem with two young children who preferred to let their drawing do the talking. Ayesha made a lovely sketch of herself and her mum standing outside Dixon House. The tree was five storeys high and an orange sun flamed. Adam didn't have much to say but spent 10 minutes making a poetic drawing. 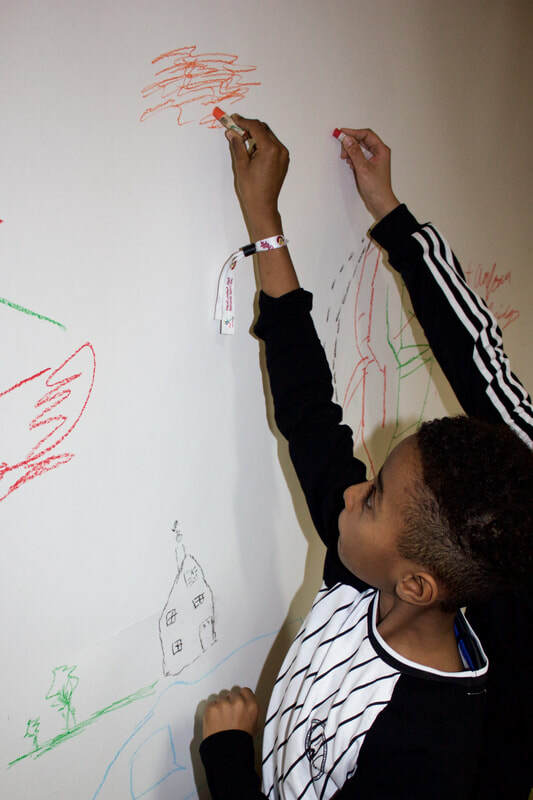 Dad Adlen was receptive to the occasion and how this might spark the creative interest of the young. Eventually Adam conjured up an enigmatic pictogram of two birds, a diamond and a dog. He didn't quite know what he had created. I wanted to tell him that I feel like that most of the time. 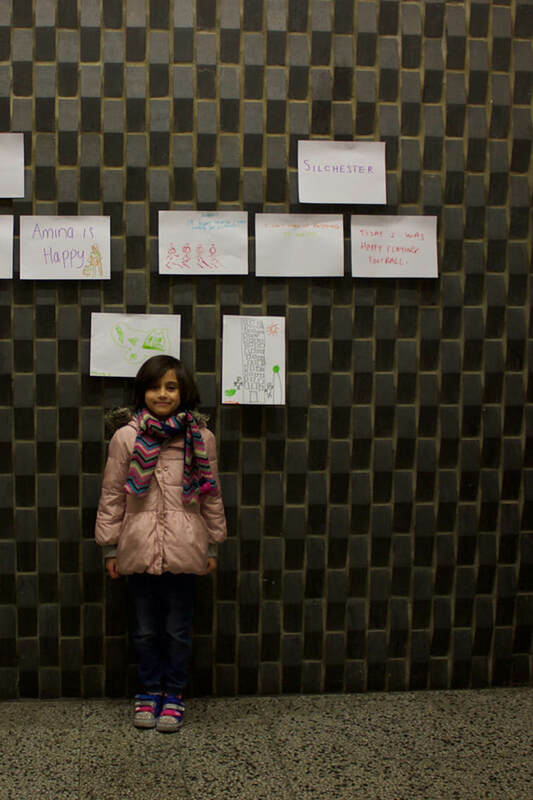 Only Harry Potter could solve the mystery of what he had created for a stranger in a lift lobby at Dixon House.